Neural injury triggers swift responses from glia, including glial migration and phagocytic clearance of damaged neurons. The transcriptional programs governing these complex innate glial immune responses are still unclear. Here, we describe a novel injury assay in adult Drosophila that elicits widespread glial responses in the ventral nerve cord (VNC). We profiled injury-induced changes in VNC gene expression by RNA sequencing (RNA-seq) and found that responsive genes fall into diverse signaling classes. One factor, matrix metalloproteinase-1 (MMP-1), is induced in Drosophila ensheathing glia responding to severed axons. Interestingly, glial induction of MMP-1 requires the highly conserved engulfment receptor Draper, as well as AP-1 and STAT92E. 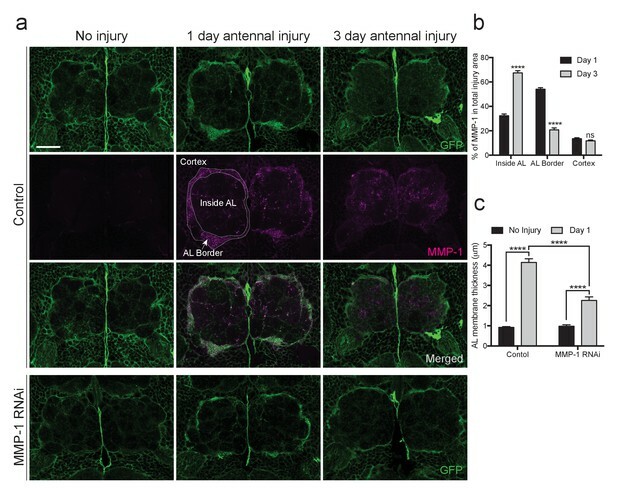 In MMP-1 depleted flies, glia do not properly infiltrate neuropil regions after axotomy and, as a consequence, fail to clear degenerating axonal debris. This work identifies Draper-dependent activation of MMP-1 as a novel cascade required for proper glial clearance of severed axons. Glial cells exhibit swift and dramatic responses to any form of neural trauma. These reactions provide neuroprotection and minimize further damage to the central nervous system (CNS. Changes in glial gene expression is one highly conserved feature of glia responding to a range of insults in the CNS (Allen and Barres, 2009; Chung et al., 2013; Doherty et al., 2009; Logan and Freeman, 2007; Logan et al., 2012; Ziegenfuss et al., 2008). Specifically, the janus kinase/signal transducer and activator of transcription (JAK/STAT) cascade is one central player in initiating reactive astrocytic and microglial responses to neural damage (Ben Haim et al., 2015; Herrmann et al., 2008; Kim et al., 2002; Park et al., 2016). Glial activation of the c-Jun N-terminal kinase (JNK) pathway and the downstream transcriptional heterodimer AP-1, which consists of c-Fos and c-Jun, has also been reported in various injury and disease models (Anderson et al., 1994; Pennypacker et al., 1994; Yu et al., 1995). However, it remains unclear what pathways are required to initiate these transcriptional programs and how they drive complex glial responses to neural injury. Reactive glia often display prominent changes in cell shape, size, or motility in response to neuronal damage. Glial cells can migrate substantial distances to reach trauma sites (Roth et al., 2014). In other instances, glial somas remain in fixed locations while the cells extend elongated processes to rapidly enter regions that house damaged neurons (Davalos et al., 2005; Dissing-Olesen et al., 2014). These striking morphogenic responses ensure that glial cells gain access to sites of damage to release protective (and sometimes detrimental) factors and clear apopototic cells and degenerating projections through phagocytic engulfment (Hines et al., 2009; Polazzi and Monti, 2010), but we still have an incomplete understanding of how these dynamic responses are elicited and carried out in reactive glia. Glial responses to injury and disease share common features across species. In Drosophila, acute axotomy triggers reactions from local glia that are strikingly similar to those observed in mammals. For example, severing adult Drosophila olfactory nerves that project into the antennal lobes of the central brain initiates a classic Wallerian degeneration (WD) program in olfactory receptor neuron (ORN) axons (Hoopfer et al., 2006; MacDonald et al., 2006). Over the course of several days, local glia extend membrane projections into the antennal lobe neuropil to phagocytose degenerating axonal and synaptic debris (Logan and Freeman, 2007; Logan et al., 2012; MacDonald et al., 2006; Ziegenfuss et al., 2012). Common molecular pathways are also activated in fly and mammalian glia responding to injury (Awasaki et al., 2006; Doherty et al., 2014; Lu et al., 2014; Macdonald et al., 2013; Ziegenfuss et al., 2008). As in mammals, the transcription factors AP-1 and STAT92E are acutely induced in Drosophila ensheathing glia in response to axotomy (Doherty et al., 2014; Macdonald et al., 2013). In addition, common molecules are required for glial clearance of engulfment targets across species, including the conserved Draper/MEGF10 receptor, downstream Syk tyrosine kinases, and Rac1-mediated cytoskeletal remodeling (Awasaki et al., 2006; Doherty et al., 2009; Logan and Freeman, 2007; Logan et al., 2012; MacDonald et al., 2006; Scheib et al., 2012). Thus, the fly represents a powerful genetic model system to explore new molecular cascades and probe the basic mechanisms driving innate glial immune reactions. In adult flies, axotomy triggers activation of the Draper receptor on local ensheathing glia, which, in turn, stimulates a positive auto-regulatory transcriptional loop. Specifically, STAT92E becomes activated and targets the draper locus to upregulate draper-I transcript levels (Doherty et al., 2014). This response ensures that adequate levels of Draper are present at the cell surface of phagocytic reactive glia. Aside from STAT92E targeting of draper, virtually nothing is known about the transcriptional programs invoked in adult Drosophila glia responding to neural injury. Here, we describe a new non-lethal nerve injury model which elicits widespread glial responses to neurodegeneration in the ventral nerve cord (VNC). Using this assay, we carried out an RNA-sequencing (RNA-Seq) analysis of VNC tissue to identify axotomy-induced changes in gene expression. We also performed a detailed in vivo functional analysis of the secreted protease matrix metalloproteinase-1 (MMP-1), a novel gene we found to be acutely upregulated in ensheathing glia responding to nerve injury. Interestingly, we show that MMP-1 induction in ensheathing glia requires Draper/STAT92E/AP-1 signaling. MMP-1 is required for proper glial recruitment to severed axons and, subsequently, timely clearance of degenerating axonal debris. Together, this work demonstrates an essential role for MMP-1 in glial recruitment and phagocytic responses post-axotomy and reveals a novel connection between Draper/STAT92E/AP-1 and requisite MMP-1 expression during glial responses to nerve injury. In the adult Drosophila olfactory system, local ensheathing glial cells upregulate the pro-engulfment isoform draper-I in an AP-1/STAT92E-dependent manner in response to axotomy, suggesting that neurodegeneration triggers transcriptional programs in fly glia. However, the glial cells that surround antennal lobe neuropil (Figure 1a,b antennal lobe, orange circles) represent a small percentage of total brain glia, which presents substantive challenges in assessing changes in antennal glial gene expression post-injury. We sought to develop an in vivo injury model that would elicit a broader glial response in order to identify differentially expressed genes using a large-scale transcriptional profiling screen. Recent studies revealed that peripheral sensory neurons in the wing undergo a classic Wallerian degeneration program and are cleared by glia in a Draper-dependent manner after axotomy (Fang et al., 2012; Fullard and Baker, 2015), suggesting that glial cells throughout the adult fly nervous system use common pathways to sense and respond to degenerating axons. Thus, we turned to the ventral nerve cord (VNC) of the fly with the goal of establishing a more robust in vivo nerve injury assay to query changes in glial gene expression. In adult flies, axons extending to and from the front, middle, and rear sets of legs project through the prothoracic (PN), mesothoracic (MN), and metathoracic (MtN) neuropil regions of the VNC, respectively. Sensory axons from the wing project through the VNC accessory mesothoracic (AMN) neuropil (Figure 1a,b). First, we asked if Draper was upregulated in various axotomy paradigms in the VNC by surgically removing select peripheral tissues and then performing Draper immunostaining on dissected VNCs one day after injury. In uninjured animals, Draper was detectable around neuropil and throughout the cortex of the VNC (Figure 1c, uninjured panels). In various injury paradigms, Draper was consistently upregulated selectively on severed nerves 24 hr after injury. For example, removal of a single wing or bilateral ablation of the front legs, resulted in strong Draper immunofluorescence in the neuropil that contained degenerating projections corresponding to each injured structure(s) (Figure 1c). Similarly, decapitation elicited robust Draper upregulation throughout the VNC (Figure 1c). The Drosophila VNC serves as a new model to study glial responses to acute axotomy. (a) Schematic representation of Drosophila brain and VNC showing major neuromere regions as uniquely colored circled regions in the CNS. Color of appendages (antennae, legs, wings) correspond to the neuromere through which the nerves from each structure project. (b) DIC image of adult brain and VNC with the corresponding neuropil regions from (a) highlighted with color-coded circles. (c) Representative Draper immunostainings of uninjured VNC and one day after right wing severing, both front legs severed and head removal. Top images show single one-micron slice, while bottom images display 50 μm maximum intensity projection. Unless otherwise noted, scale bar = 30 μm. Genotypes: Figure 1c: w1118. The adult Drosophila brain contains discrete glial subtypes that vary in location, gene expression, and function (Awasaki et al., 2008; Edwards et al., 2012; Freeman, 2015; Hartenstein, 2011; Omoto et al., 2015). Cortex glia enwrap neuronal cell bodies throughout the cortex, while neuropil regions contain two unique types of glia: ensheathing glia and astrocytes (Doherty et al., 2009). In the adult olfactory system, ensheathing glia, but not astrocytes, respond to degenerating ORN axons by upregulating draper, invading the neuropil, and clearing axonal debris (Doherty et al., 2009; Logan and Freeman, 2007; Logan et al., 2012; MacDonald et al., 2006). We used several well-characterized glial subtype drivers to express membrane-tethered GFP (UAS-mCD8::GFP) and found that the patterns of glial labeling in the adult VNC recapitulated the patterns of the central brain. The pan-glial driver repo-Gal4 appeared to label most, if not all, VNC glia (Figure 2a). The astrocyte driver alrm-Gal4 also specifically labeled glia immediately surrounding the neuropil and they displayed a classic astrocyte-like, highly branched pattern (Figure 2a). Finally, TIFR-Gal4 labeled glia in an ensheathing-like pattern; we detected high levels of GFP in neuropil-associated ensheathing glia and, as in the central brain, low expression in some cortex glia (Figure 2a). Thus, the adult VNC contains similar classes of glia that can be discretely labeled and manipulated with glial subtype-specific genetic drivers. Draper and ensheathing glial membranes are recruited to injury sites in the adult VNC after peripheral axotomy. (a) Membrane-tethered GFP (UAS-mCD8::GFP) was expressed under the control of a pan glial driver (left), astrocyte-specific driver (middle), or ensheathing glial driver (right). Images depict single micron slices ~15 μm deep into the VNC. 10 μm (pan-glial) or 50 μm (astrocytes and ensheathing glia) Z-stack projections are also shown. Lower images depict 5 μm (pan glial) or 20 μm (astrocytes, ensheathing glia) higher magnification projections of the prothoracic neuromeres. (b-d) One-micron single confocal slice images showing GFP-labeled glial membranes (mCD8::GFP) and Draper immunostaining of the AMN neuropil region after left wing injury. (b, c) Ensheathing glia expressing mCD8::GFP alone (b) or co-expressing DraperRNAi animals (c). (d, e) Astrocyte glia expressing mCD8::GFP alone (b)or co-expressing DraperRNAi animals. High magnification merged images in (b) and (d) show regions outlined with dotted line. Scale bars = 30 μm. Genotypes: Figure 2a: pan glial: repo-Gal4,UAS-mCD8::GFP/TM3. astrocytes: UAS-mCD8::GFP/CyO; alrm-Gal4/TM3. ensheathing glia: UAS-mCD8::GFP/CyO; TIFR-Gal4/TM3. Figure 2b: UAS-mCD8::GFP/CyO; TIFR-Gal4/TM3. Figure 2c: UAS-mCD8::GFP/CyO; TIFR-Gal4/DraperRNAi. Figure 2d: UAS-mCD8::GFP/CyO; alrm- Gal4/TM3. Figure 2e: UAS-mCD8::GFP/CyO; alrm-Gal4/DraperRNAi. Draper can be upregulated in either ensheathing glia or astrocytes in response to axon degeneration, depending upon the context (Doherty et al., 2009; Tasdemir-Yilmaz and Freeman, 2014). To determine if Draper is upregulated in VNC ensheathing glia and/or astrocytes post-injury, we repeated peripheral nerve injuries in flies expressing membrane-tethered GFP in each subtype. Removal of a single wing resulted in an expansion of ensheathing glial membrane and striking upregulation of Draper around the AMN neuropil on the injured side (Figure 2b). Notably, these signals appeared to overlap (merged, Figure 2b). Ensheathing glial expression of DraperRNAi largely eliminated the ensheathing glial membrane expansion and Draper increase following left wing injury (Figure 2c). We did not detect any astrocyte membrane expansion following left wing injury, nor substantial Draper/astrocyte membrane overlap (Figure 2d). In addition, expression of DraperRNAi in astrocytes did not attenuate injury-induced Draper upregulation following injury to the left wing (Figure 2e). Our results suggest that, as in the olfactory system of the central brain, VNC ensheathing glia, but not astrocytes, respond to degenerating axons in the VNC by upregulating Draper. Draper is essential for engulfment of degenerating ORN axons in the adult olfactory system (Doherty et al., 2009; Logan and Freeman, 2007; Logan et al., 2012; MacDonald et al., 2006). To determine if Draper is similarly required in the VNC, we labeled Gr22c gustatory receptor neurons with membrane-tethered GFP (Gr22c-Gal4 x UAS-mCD8::GFP). A single Gr22c cell body resides on each front leg and projects through the PN neuropil. We transected the right front leg adjacent to the thorax, and imaged Gr22c axons in dissected VNCs after 48 hr. At this time point, no Gr22c GFP+ axonal material was visible in the right (injured) neuropil region, while the contralateral Gr22c projection was intact (Figure 3a). Fragmentation of the severed Gr22c axons was blocked by co-expression of Wlds (UAS-Wlds) (Figure 3a), indicating that these axons undergo a classic Wallerian degeneration program post-injury. 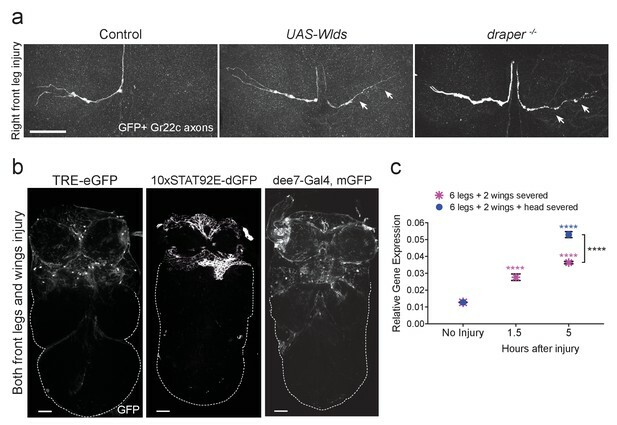 Notably, degenerating Gr22c axons were still detectable in draper mutant flies (Figure 3a), indicating that Draper is required in multiple regions of the CNS for efficient clearance of axonal debris in adult animals. Draper is required for clearance of sensory neuron axons undergoing Wallerian degeneration in the adult VNC. (a) Representative confocal images of the prothoracic neuromere (PN) region two days after the front right leg injury are shown. GFP-labeled Gr22c gustatory axons in the PN region of control flies (left), with co-expression of Wlds (center), or in a draper mutant background (right). Arrows point to axon that failed to degenerate in Wlds-expressing axons or degenerating axons that remained uncleared in draper mutants. (b) Representative one micron images of adult VNCs from flies that carry the AP-1 reporter TRE-eGFP, 10XSTAT92E-dGFP, or the Draper reporter dee7-GFP. Reporter activation was largely restricted to the PN and AMN regions after injury to both front legs and wings. Dotted line shows outline of the posterior VNC tissue housing uninjured projections. (c) Quantitative real-time PCR of normalized expression levels of draper-I transcript in VNCs following injury to all legs and both wings (magenta asterisks) or following injury to all legs, both wings, and head decapitation (blue circles). Draper threshold cycle (Ct) values were normalized to ribosomal protein L32. Biological replicates: 6 legs + 2 wings: No Injury N = 8; 1.5 hr N = 3; 5 hr N = 3. 6 legs + 2 wings+head: No Injury N = 8; 5 hr N = 7. Mean ± SEM plotted; ****p<0.0001; Two-way ANOVA with Sidak post hoc test. Each injury group was compared to uninjured in the same group. Black asterisks depict comparison between the two injury groups at the 5 hr time point. Scale bars = 30 μm. Genotypes: Figure 3a: Control: Gr22c-Gal4/+; UAS-mCD8::GFP/+. Wlds: UAS-Wlds/+; Gr22c-Gal4/+; UAS-mCD8::GFP/+. draper-/-: Gr22c-Gal4/UAS-mCD8::GFP; draperΔ5rec9/draperΔ5rec9. Figure 3b: TRE-eGFP: TRE-eGFP/TRE-eGFP (on II); 10xSTAT92E-dGFP: 10xSTAT92E-dGFP/10xSTAT92E-dGFP (on II); dee7-Gal4, mGFP: dee7-Gal4, UAS-mCD8::GFP/CyO. Figure 3c: w1118. In the olfactory system, ORN axotomy stimulates activity of two highly conserved transcription factors: (1) the Jra/kayak heterodimer, which is homologous to the AP-1 complex (Macdonald et al., 2013) and (2) STAT92E (Doherty et al., 2014). To first determine if AP-1-dependent transcription is triggered in the VNC after peripheral nerve injury, we used a well characterized Jra/kayak in vivo transgenic reporter (TRE-eGFP) to monitor activity of AP-1 in the VNC. TRE-eGFP contains 10 tandem AP-1 binding sites upstream of eGFP (Chatterjee and Bohmann, 2012). In uninjured VNC, we observed almost no eGFP signal (not shown), but after bilateral ablation of the front legs and wings, we saw robust upregulation of eGFP specifically in the PN and AMN neuropil and surrounding cortical regions (Figure 3b). Next, we assessed STAT92E activity in the VNC by using the in vivo reporter 10XSTAT92E-dGFP, which contains 10 tandem STAT92E binding sites upstream of destabilized GFP (dGFP) (Bach et al., 2007). dGFP was undetectable in uninjured VNCs (not shown), but following ablation of front legs and wings, we observed a striking increase in dGFP expression only in the corresponding neuropil regions and surrounding cortex (Figure 3b). Together, these results indicate that AP-1 and STAT92E are activated in VNC glia after axotomy and also suggest that common transcriptional programs are stimulated throughout the adult nervous system in response to nerve injury. Doherty et al. recently identified a 2619 base pair (bp) region of the draper promoter that is specifically activated in ensheathing glia following ORN injury, referred to as draper enhancer element 7 (dee7) (Doherty et al., 2014). The dee7-Gal4 flies express Gal4 under the control of this 2619 bp fragment. Expression is quiescent in the uninjured adult brain, but activated in olfactory ensheathing glia after ORN axotomy, and this promoter fragment contains several requisite STAT92E binding sites for injury-induced activation (Doherty et al., 2014). We tested the dee7-Gal4 driver line in our VNC peripheral nerve injury model by crossing this strain to UAS-mCD8::GFP flies. One day after bilateral ablation of front legs and wings, we consistently observed robust activation throughout the anterior VNC (Figure 3b), which suggests that similar promoter elements in the draper locus are targeted in VNC glia in response to nerve injury. Next, we performed a quantitative PCR (Q-PCR) time course against draper-I in VNC tissue 0, 1.5, and 5 hr after ablation of all legs, wings, and/or head. draper-I was significantly upregulated in the VNC at all time points in both injury paradigms, with the highest upregulation (~4 fold change) observed 5 hr after all limbs and the head were removed (Figure 3c). Collectively, our results indicate that peripheral nerve injury induces transcriptional upregulation of draper in the adult VNC and further support the notion that common transcriptional programs are activated in ensheathing glia throughout the adult nervous system. Once we determined that STAT92E/AP-1 activity, as well as draper-I transcription, was increased in the VNC after nerve injury, we assessed genome-wide changes in the adult VNC by performing RNA-seq on dissected VNC tissue after severing legs, wings, and heads of adult animals. Analysis was performed on five biological replicates for each time point (uninjured and five hours post-injury). We obtained 14.5 million ± 1 million single end 100 bp reads per sample (Figure 4—source data 1). 85.2 ± 0.39% of the reads mapped to the Drosophila genome, with 41.2 ± 2.6% mapping to exons (Purice et al., 2017). RNAseq reads were aligned to the Drosophila genome (Release 5.57) via the Burrow-Wheeler Alignment tool (Li and Durbin, 2009). Raw read counts were converted to transcripts per kilobase million (TPM) (Wagner et al., 2012) and genes detected at <2 TPM in both conditions (4988 of 14,352) were deemed ‘not expressed’ (Wagner et al., 2013) and eliminated from further analysis (Figure 4—source data 2), which was then carried out on 9,364 ‘expressed’ genes. A principal component analysis (PCA) (Figure 4a, top panel) and sample distance heatmap (Figure 4a, bottom panel) revealed that the variance between biological replicates of the groups (uninjured vs. injured) was greater than the variance within groups. Moreover, a correlation analysis indicated a high degree of correlation between the biological replicates within each sample group (Figure 4—source data 2). Analysis of differential expression (DE) was conducted in the START (Shiny Transcriptome Analysis Resource Tool) application (Nelson et al., 2017). Using a cutoff of ≥2 fold DE (adj. p-value<0.01, Benjamini-Hochberg procedure), we identified 306 genes (167 upregulated, 139 downregulated) (Figure 4b and Figure 4—source data 2). Homologs of these differentially expressed genes, which were identified by the DRSC Integrative Ortholog Prediction Tool (DIOPT) program, are provided in Figure 4—source data 3 (Hu et al., 2011). Based on our stringent adjusted p-value of <0.01, we identified an additional 459 genes (225 upregulated and 234 downregulated) that were differentially expressed in the range of 1.2- to 1.9-fold. This gene list is provided in supplemental source data files (Figure 4—source data files 2–5), but, because of the low DE values, we have separated this cohort from those genes that fall above the 2.0 DE threshold. We also excluded genes within the 1.2–1.9 DE range from our primary START analysis shown in Figure 4b and Annokey analysis (Table 1). Because of cell type heterogeneity in VNC tissue samples, genes that were modestly altered (between 1.2–1.9 fold DE) by RNAseq may, in fact, be transcriptionally up/downregulated more robustly (≥2.0 fold) in glia responding to axotomy and represent functionally relevant immunefactors. RNA-seq analysis reveals functionally discrete groups of injury-induced genes in the adult VNC. (a) A Principal Component Analysis (top) and Sample Distance Heatmap (bottom) of all biological replicates (uninjured and injured) generated in START for genes expressed at >2 TPM (9364 genes). (b) Volcano plot of the gene expression analysis generated in START. The threshold for differential expression was set at 2-fold change (log2 = 1) with an adjusted p-value<0.01. logFC = log of fold change. adj. = adjusted (for multiple comparisons by Benjamin-Hochberg procedure). (c) Analysis of injury-induced gene expression revealed known members of the highly conserved Draper/AP-1 and Toll pathways. Genes upregulated ≥2.0 fold in VNC post-injury are noted with red asterisks. (d) START-generated heat map for a small set of hand-selected genes, including genes highlighted in panels (c) and (e), as well as genes previously identified as requisite factors during glial clearance of severed axons (see Figure 4—source data 5). Top dendrogram depicts hierarchical clustering of sample distances calculated from gene listed on left side of map. Right dendrogram was generated according to fold-change (uninjured versus injured). Genes at the top of the list were strongly upregulated in injured samples. (e) Quantitative real-time PCR validation of a subset of upregulated or downregulated genes from RNA-seq screen. N ≥ 3 biological replicates; mean ±. SEM plotted; ***p<0.001; **p<0.01; ns = not significant; Students t-test. Genotypes: Figure 4e: w1118. Annokey analysis results of upregulated genes associated with glial membrane expansion and movement. (a) List of terms used in Annokey analysis. (b) Top ten hits associated with our Annokey key terms in Drosophila, mouse, and human. MMP-1/MMP-14 (red bold) is included in the top ten list for each species. Interestingly, components of known innate immunity signaling pathways were included in our list of differentially expressed genes. For example, we detected upregulation of JNK/AP-1 signaling components downstream of Draper, which is consistent with published work describing the role of the JNK/AP-1 pathway during glial recruitment/phagocytic responses to axonal injury in the adult Drosophila olfactory system (Lu et al., 2017; Macdonald et al., 2013) (Figure 4c,d). In addition, several members of the Spatzle/Toll pathway were upregulated (Figure 4c,d). The Toll pathway, including the downstream transcription factors Cactus and Dorsal, which are known players in innate immunity (Valanne et al., 2011), is elicited in response to Wallerian degeneration in vertebrate models (Boivin et al., 2007; Rotshenker, 2011). Finally, to date, only ~30 Drosophila genes have been implicated in glial responses to nerve injury. When mutated, knocked down, or overexpressed in glia, these factors prevent proper clearance of degenerating axons. Nine of these genes (27%) were transcriptionally altered in our RNAseq screen (Figure 4—source data 4). 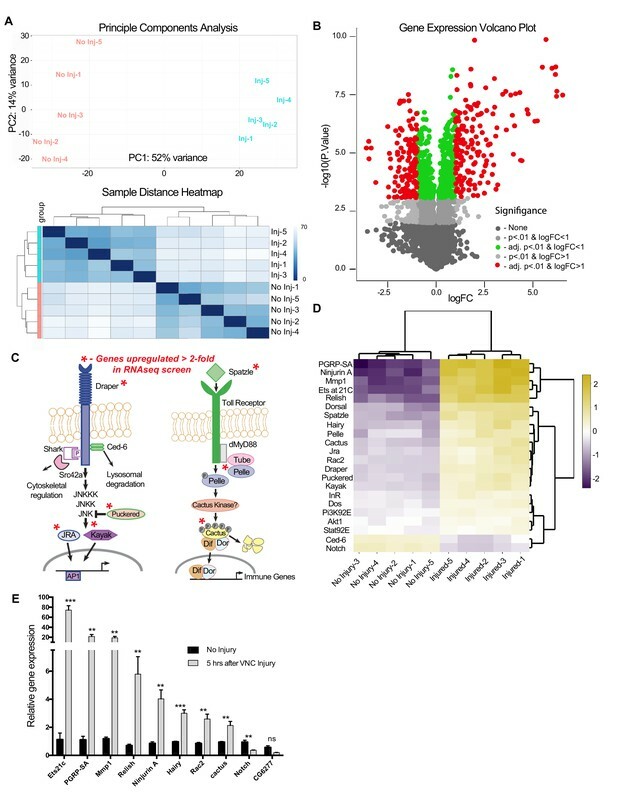 Together, these comparisons suggest that our method of transcriptional profiling the adult VNC after peripheral nerve injury is a valuable strategy to identify factors functionally coupled to innate glial immune responses. Next, we performed confirmational Q-PCR on a subset of differentially expressed genes (8 upregulated and 2 downregulated) from our screen and measured transcript levels 5 hr after severing legs, wings, and heads (Figure 4e). With the exception of CG6277, all genes were significantly changed in a manner consistent with our RNA-seq data. Correlation analysis comparing fold-change for all 10 genes (RNA-seq versus Q-PCR) revealed a Pearson’s coefficient of r = 0.860 (p=0.003) (Figure 4—source data 5), indicating the robustness of the RNAseq screen to accurately measure the magnitude of differential gene expression. Following neural injury, glial cells undergo dramatic changes in size, shape, and migratory behavior to ensure that they quickly infiltrate areas of trauma and efficiently clear degenerating neuronal debris (Anderson et al., 2014; Bardehle et al., 2013; Hong and Stevens, 2016; MacDonald et al., 2006; Napoli and Neumann, 2009). However, the transcriptional cascades that govern these striking aspects of glial immune responses are not entirely clear. Thus, to glean new insight into the factors required for glial migration and altered membrane dynamics following nerve injury, we took a two-step approach to determine if our VNC injury RNA-seq results might reveal critical conserved genes implicated in cell migration, membrane remodeling, and related events. First, we used the DRSC Integrative Ortholog Prediction Tool (DIOPT) program (Hu et al., 2011) to identify the closest orthologs for all differentially expressed genes in mouse and humans (Figure 4—source data 3), with the ultimate goal of focusing our analysis on conserved, upregulated genes. Next, we utilized Annokey (Park et al., 2014), an open source tool that queries the Entrez Gene database and linked Pubmed articles with a user generated gene list and a set of user defined search terms. For our analysis, we compared the upregulated set of genes (≥2.0 fold, adj p<0.01) and mammalian homologs against a set of ten search terms related to cell motility and morphogenesis (Table 1a). The top ten genes with the highest search term matches are listed in Table 1b; a complete summary of Annokey matches for all upregulated genes and associated Entrez Gene hyperlinks are provided in Table 1—Source code 1–3. One interesting gene that emerged from this analysis was matrix metalloproteinase-1 (Mmp-1, see Table 1a), which was a top ten Annokey match to our select search terms across all three species (Drosophila, mouse, and human) (Table 1b) and was also robustly upregulated in injured VNC tissue by RNA-seq analysis (~12 fold) (Figure 4—source data 2). MMPs are proteases implicated in extracellular matrix remodeling, cell migration, and metastasis of cancer cells (Nagase and Woessner, 1999; Rosenberg, 2002; Verma and Hansch, 2007; Vu and Werb, 2000). The role of glia-derived MMPs in mammals is controversial. While some studies have shown that MMPs have detrimental roles in response to injury, others show that they are neuroprotective and promote CNS repair (Zhang et al., 2011). A detailed analysis of MMP function has been hindered by the fact that there are over 23 partially redundant MMP genes in mammals (Page-McCaw et al., 2007). In contrast, the Drosophila genome contains only two MMP genes: Mmp-1, a secreted protease, and Mmp-2, which is GPI anchored (Page-McCaw et al., 2003). Therefore, we chose to take advantage of our Drosophila in vivo injury models to explore the role of MMP-1 during early responses to nerve axotomy. The expression pattern of MMP-1 in the adult Drosophila CNS is unknown. Thus, to first determine MMP-1 protein levels and localization before and after injury in the adult VNC, we used flies that expressed membrane-tethered GFP (UAS-mCD8::GFP) specifically in ensheathing glia (TIFR-Gal4), performed a unilateral wing ablation, and then stained tissue with α-MMP-1 one day after injury. We observed a robust increase in MMP-1 in the AMN (wing-innervated) neuropil region on the injured side, and a subset of MMP-1 signal clearly overlapped with ensheathing glial membranes (Figure 5a, white arrows). MMP-1 was also significantly increased on Western blots of dissected VNC tissue following bilateral ablation of legs and wings (Figure 5b,c). MMP-1 is upregulated in the adult VNC and the antennal lobes in response to axon neurodegeneration. (a) Representative one-micron confocal images of the anterior VNC expressing membrane-tethered GFP in ensheathing glia and immunostained for MMP-1 after left wing injury. White arrows point regions of increased Draper and glial membrane GFP on the side of injury. (b) Western blot stained with anti-MMP-1 (top panel) and total protein stain (bottom). VNC lysates from uninjured and injured (all legs and both wings) w1118 flies. (c) Quantification of MMP-1 Western blots shown in panel b; **p<0.01; unpaired t-test; N = 4 biological replicates. (d) Schematic representation of the adult olfactory nerve injury assay. Olfactory neurons within the antennae and maxillary palps project into the antennal lobes (dark orange circles labeled as AL). (e) Comparative Q-PCR analysis of three select upregulated genes from RNA-seq screen (hairy, MMP-1 and ets21c) in injured VNCs (legs, wings, and head) (left) and in the central brain after bilateral antennal and maxillary nerve axotomy (right). Values were normalized to ribosomal protein L32. N = 3 biological replicates per group. Mean ± SEM plotted; **p<0.01; *p<0.05; unpaired t-test. (f) Maximum intensity projections (25 μm) of MMP-1 immunostaining in the antennal lobe region of adult brains. In uninjured animals MMP-1 expression is localized to the trachea (arrows). Robust MMP-1 activity is observed in flies after a bilateral antennal injury. Specific accumulation of MMP-1 on maxillary palp axons and glomeruli after bilateral maxillary nerve axotomy indicated by arrowheads. Scale bars = 30 μm. Genotypes: Figure 5a: UAS-mCD8::GFP/CyO; TIFR-Gal4/TM3. Figure 5b–f: w1118. We then focused our analysis on the adult olfactory system, which offers additional genetic tools for cellular analysis. The Drosophila olfactory system contains two sets of external structures, the antennae and maxillary palps, which house ORNs that project to the antennal lobes in the central brain (Figure 5d). Removal of the antennae or maxillary palps severs the antennal or maxillary nerves, respectively, and local ensheathing glia respond by infiltrating the antennal lobes and clearing degenerating ORN material (Doherty et al., 2009). One notable advantage of the olfactory system nerve injury assay is that it permits analysis of degenerating sensory axons projecting into the antennal lobes with no interference from injured efferent projections to the antennae or maxillary palps. First, we performed a small-scale comparative Q-PCR analysis of a few upregulated genes identified in our VNC RNA-seq screen. All three queried genes were significantly upregulated in the VNC after injury (Hairy, MMP-1, and Ets21C) and, importantly, also in the central brain 3 hr after severing the antennal and maxillary nerves (Figure 5e), further suggesting that common transcriptional cascades are stimulated in central brain and VNC glia after neural injury. Next, we assessed MMP-1 levels by immunostaining 24 hr after severing olfactory nerves. In uninjured brains, MMP-1 was detected at low levels on the tracheal network (arrows in Figure 5f). MMP-1 levels were dramatically increased in the antennal lobe neuropil regions 24 hr after severing both antennal nerves (Figure 5f, middle panel); we also observed a striking increase specifically on maxillary palp glomeruli after bilateral maxillary nerve injury (arrowheads, right panel Figure 5f). Together, these findings indicate that MMP-1 is acutely upregulated in the adult olfactory system after axotomy. Finally, we hypothesized that ensheathing glia are responsible for the MMP-1 increase in the antennal lobes after olfactory nerve injury since (a) we observe a robust overlap between MMP-1 and ensheathing glial membranes in the injured VNC (Figure 5a) and (b) based on all known transcriptional and cellular readouts, ensheathing glia are the primary responders to antennal or maxillary nerve injury in the adult Drosophila olfactory system. 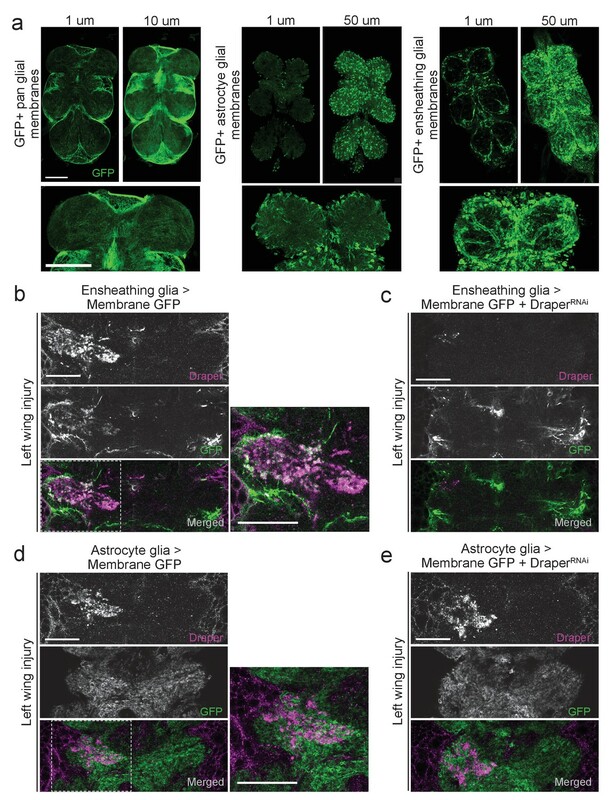 We performed a more detailed analysis of MMP-1 localization in the antennal lobes after olfactory nerve axotomy by using various drivers to express membrane-tethered GFP (UAS-mCD8::GFP) in distinct cell types of the antennal lobe, including ensheathing glia (TIFR-Gal4), astrocytes (alrm-Gal4), a subset of maxillary palp ORNs (OR85e-Gal4), or in all ORNs with the pan-ORN driver (orco-Gal4). Notably, after antennal nerve injury, we observed overlap of MMP-1 and expanding ensheathing glial membranes but not astrocytic membranes (Figure 6a,b). Moreover, we do not observe MMP-1 accumulation on uninjured maxillary palp projections (dotted outlined regions in Figure 6c,d) despite the fact they were surrounded by degenerating antennal ORN axons after antennal nerve injury (Figure 6c,d). MMP-1 largely overlaps with ensheathing glia and degenerating axons after olfactory nerve injury. (a–d) Representative high magnification images of MMP-1 expression three days after antennal nerve injury in flies expressing membrane tethered GFP in discrete antennal lobe cell types. The same antennal lobe region for each uninjured and injured sample is shown. (a) After injury, MMP-1 (magenta) co-localizes with expanding GFP-labeled ensheathing glial membranes (green) (arrows). (b) GFP-labeled astrocyte glial membranes (green) display little overlap with MMP-1 (magenta) after injury. (c,d) After antennal nerve injury, MMP-1 (magenta) is void in glomeruli that contain uninjured GFP-labeled OR85e maxillary palp axons (green, dotted outline). (d) Pan-ORN expression of GFP (green) shows MMP-1 (magenta) accumulation in regions of degenerating ORN material (arrowheads) and lack of MMP-1 in areas that house maxillary palp ORNs (dotted outlines). Scale bars = 10 μm. One micron slice shown for all panels. Genotypes: Figure 6a: UAS-mCD8::GFP/Cyo; TIFR-Gal4/TM3; Figure 6b: UAS-mCD8::GFP/CyO; alrm-Gal4/TM3; Figure 6c: OR85e-mCD8::GFP/CyO; Figure 6d: w1118; orco-Gal4/UAS-mCD8::GFP. ORN axotomy initiates a positive autoregulatory feedback loop in ensheathing glia, in which the activated Draper receptor triggers transcriptional upregulation of draper-I via JNK/AP-1 and STAT92E (Doherty et al., 2014; Lu et al., 2017; Macdonald et al., 2013). Thus, we wondered if a Draper signaling cascade might also target the Mmp-1 locus in ensheathing glia after nerve injury. Indeed, we found that the local increase of MMP-1 in the VNC typically observed after leg injury (white arrowheads, Figure 7a) was undetectable in draper null mutants (Figure 7a). Similarly, in the olfactory system, MMP-1 upregulation was completely blocked in draper−/− flies (Figure 7b), indicating that Draper is essential for glial production of MMP-1 in a variety of contexts post-injury. Draper/STAT92E/AP-1 are required for MMP-1 upregulation after injury. (a) Representative images of control and draper null animals one day after right middle leg injury. One-micron slices shown. Arrowheads point to neuropil that contain injured projections. (b) Representative images of control and draper null animals one day after bilateral antennal nerve axotomy. Maximum intensity projections shown (25 um). (c) Adult specific knockdown of STAT92E in glial cells leads to attenuated MMP-1 response to maxillary palp injury. Maximum intensity projections (25 μm) of MMP-1 immunostainings in control and STAT92ERNAi flies. (d) Quantification of MMP-1 fluorescence in (c). Antennal lobes quantified: Control: No Injury N = 17; MP Injury N = 22. STAT92eRNAi: No Injury N = 10; MP Injury N = 14. Mean ± SEM plotted; ****p<0.0001; One-way ANOVA with Sidak post hoc test. (e) Adult specific knock down of kay and Jra in glial cells leads to attenuated MMP-1 response to maxillary palp injury. Maximum intensity projections (25 μm) of MMP-1 immunostainings in control and RNAi-expressing flies. (f) Quantification of MMP-1 fluorescence in (e). Antennal lobes quantified: Control: No Injury N = 22; MP Injury N = 24. kayRNAi: No Injury N = 24; MP Injury N = 28. JraRNAi: No Injury N = 22; MP Injury N = 30. Mean ±SEM plotted; ****p<0.0001; One-way ANOVA with Sidak post hoc test. Scale bars = 30 μm. Genotypes: Figure 6a,b: w1118 and draper -/-: draperΔ5rec9/draperΔ5rec9; Figure 6c–f: Control: w1118; OR85e-mCD8::GFP, tubulin-Gal80ts/+; repo-Gal4/+. STAT92ERNAi: w1118; OR85e-mCD8::GFP, tubulin-Gal80ts, UAS-STAT92ERNAi; repo-Gal4/+. kayRNAi: w1118; OR85e-mCD8::GFP, tubulin-Gal80ts/+; repo-Gal4/UAS-kayRNAi. JraRNAi: w1118; OR85e-mCD8::GFP, tubulin-Gal80ts/+; repo-Gal4/UAS-JraRNAi. To determine if the transcription factors STAT92E or AP-1 are required for MMP-1 upregulation after axotomy, we performed in vivo knockdown experiments and assessed MMP-1 levels post-injury. Specifically, we used the pan glial driver repo-Gal4 to express RNAi against STAT92E (UAS-STAT92ERNAi) or each subunit of the AP-1 heterodimer, kayak and Jra (UAS-kayRNAi or UAS-JraRNAi). In addition, these flies carried a tubulin-Gal80ts transgene, which allowed us to temporally control the activity of GAL4 and, thus, specifically express each RNAi construct in post-mitotic adult glia. Interestingly, we found that glial depletion of STAT92E, kayak, or Jra resulted in significant inhibition of MMP-1 induction 24 hr after maxillary nerve axotomy (Figure 7c–f). Collectively, these results suggest that axon injury stimulates the Draper receptor to activate Mmp-1 gene expression in glia, in a STAT92E/AP-1 dependent manner. Aside from the positive transcriptional feedback loop that has been described for draper (Doherty et al., 2014), Mmp-1 now represents the first injury-responsive gene downstream of the Draper/MEGF10 receptor, suggesting that a broader Draper/STAT92E/AP-1 transcriptional program is activated in adult glia following axon injury. In the adult Drosophila CNS, ensheathing glia, but not astrocytes, express Draper and respond to olfactory nerve axotomy by upregulating draper-I, invading injured neuropil areas, and clearing degenerating neuronal debris (Doherty et al., 2009). We observed a dramatic increase in MMP-1 staining in a pattern that is strikingly similar to the ensheathing glial membrane expansion (Figure 2c). However, as MMP-1 is a secreted molecule, localization of the protein may not reflect its cell of origin. Thus, we took advantage of a previously characterized in vivo transcriptional reporter that expresses cytosolic beta-galactosidase (β-gal) under the control of a 4.7 kb fragment of the MMP-1 promoter (Mmp-1-LacZ) (Uhlirova and Bohmann, 2006). We analyzed activation of this reporter in flies that also carried the STAT92E or AP-1 transcriptional reporters, 10XSTAT92E-dGFP or TRE-GFP, which are both selectively activated in olfactory ensheathing glia after antennal nerve injury (Doherty et al., 2009; Macdonald et al., 2013). We found that in Mmp-1-LacZ flies, β-gal was almost undetectable in uninjured brains, but levels were dramatically upregulated around the antennal lobes 24 hr after ORN axotomy (Figure 8a,b). Notably, we detected a striking overlap between increased ensheathing glial GFP expression in the 10XSTAT92E-dGFP and TRE-GFP flies and β-gal after injury (Figure 8a,b). Finally, we used the ensheathing glial driver TIFR-Gal4 to knockdown Draper by RNAi (UAS-DraperRNAi) in this glial subset. 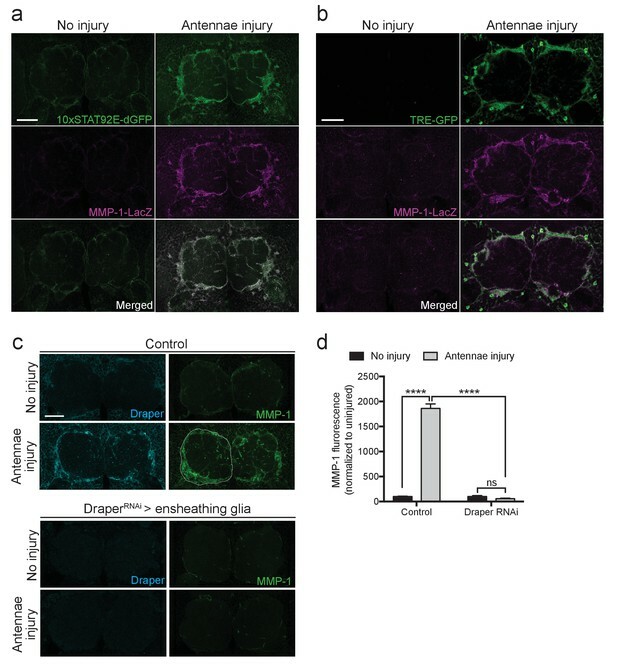 Strikingly, MMP-1 production was completely blocked one day after antennal nerve injury after depleting ensheathing glia of Draper (Figure 8c,d), strongly suggesting that MMP-1 is induced in ensheathing glia following ORN injury, in a Draper-dependent manner. Ensheathing glia produce MMP-1 in response to axon injury. (a) Representative one micron confocal slices of the antennal lobe region showing STAT92E-dependent activation of dGFP (green) and MMP-1-LacZ transcriptional activity (β-gal in magenta) within the same cells one day after antennal nerve injury. (b) Representative one micron confocal slices of antennal lobes showing AP-1 activation (green) and MMP-1-LacZ transcriptional activity (β-gal in magenta) within the same cells one day after antennal injury. (c) Representative Draper (cyan) and MMP-1 (green) immunostainings in control animals or following ensheathing glial knockdown of Draper before and after antennal nerve injury. White dotted outline in control injured MMP-1 panel shows representative ROI for quantification. (d) Quantification of MMP-1 before and one day after nerve injury in control and DraperRNAi-expressing flies. Antennal lobes quantified: Control: No Injury N = 24; Antennae Injury N = 29. DraperRNAi: No Injury N = 12. Antennae Injury N = 24. Mean ± SEM plotted; ****p<0.0001; ns = not significant; Two-way. ANOVA with Sidak post hoc test. Scale bars = 30 μm. Genotypes: Figure 7a: 10xSTAT92E-dGFP/MMP-1-LacZ. Figure 7b: TRE-GFP/MMP-1-LacZ. Figure 7c: Control: TIFR-Gal4/+. DraperRNAi: TIFR-Gal4/UAS-DraperRNAi. MMPs can proteolytically target extracellular matrix molecules and influence cell migration, membrane outgrowth and invasion (Brown and Murray, 2015; Nabeshima et al., 2002). Thus, we reasoned that Draper-dependent activation of MMP-1 may be essential for ensheathing glial cells to access degenerating axons in the antennal lobe neuropil. We expressed membrane-tethered GFP in glia (repo-Gal4, UAS-mCD8::GFP) and quantified (a) expansion of glial membranes and (2) MMP-1 immunostaining around the antennal lobes one day after antennal nerve injury. In injured control flies, we observed a robust MMP-1 increase, particularly at the periphery of the antennal lobes, in areas overlapping with glial cell bodies and notable glial membrane expansion at this timepoint (Figure 9a,b, ‘AL Border’). Because MMP-1 is a secreted factor, we wondered if the distribution of MMP-1 may change over days. Indeed, three days after antennal nerve injury, we observed more MMP-1 immunostaining localized to the central regions of the antennal lobes (‘Inside AL’), as compared to the periphery of the antennal lobes (‘AL Border’) (Figure 9a,b). No MMP-1 expression was detected one or three days after injury in flies expressing MMP-1RNAi under the control of the same glial driver (Figure 9—figure supplement 1). Injury-induced glial membrane expansion is attenuated in MMP-1-depleted animals. (a) Glial membranes are labeled with membrane-tethered GFP (green). Representative one micron confocal images of the antennal lobe regions show GFP and MMP-1 immunostaining (magenta) in control and glial-MMP-1RNAi animals. (b) Quantification of MMP-1 in control animals one and three days after antennal nerve injury inside the antennal lobe (Inside AL), at the AL border (AL Border), and in the cortex region (Cortex). Antennal lobes quantified: Day 1: N = 26 antennal lobes; Day 3: N = 21 antennal lobes. Mean ±SD plotted; ****p<0.0001; ns = not significant; unpaired t-test. (c) Quantification of GFP+ glial membrane expansion one day after antennal nerve injury in control and MMP-1RNAi flies; Antennal lobes quantified: Control: No Injury N = 34; Day 1 N = 30. MMP-1RNAi: No Injury N = 12; Day 1 N = 24. Mean ±SEM plotted; ****p<0.0001; Two-way ANOVA with Sidak post hoc test. Scale bars = 30 μm. Genotypes: Figure 8a–c: Control: repo-Gal4, UAS-mCD8::GFP/+. MMP-1 RNAi: UAS-MMP-1RNAi/+; repo-Gal4, UAS-mCD8::GFP/+. Importantly, we also found that glial membrane expansion was significantly reduced in MMP-1RNAi flies one day after antennal nerve axotomy (Figure 9a,c), and several days later we observed striking differences in glial membrane distribution throughout the antennal lobes. In control flies, the glial membrane pattern shifts from distinct wrapping of glomeruli to a more diffuse distribution three days after nerve injury. This shift in pattern is notably less pronounced in glial MMP-1-depleted flies (Figure 9a,c and Figure 9—figure supplement 2). Studies of normal cell migration and tumor cell invasion demonstrate that MMP-1 expression influences actin remodeling during cell movement (Rudrapatna et al., 2014). 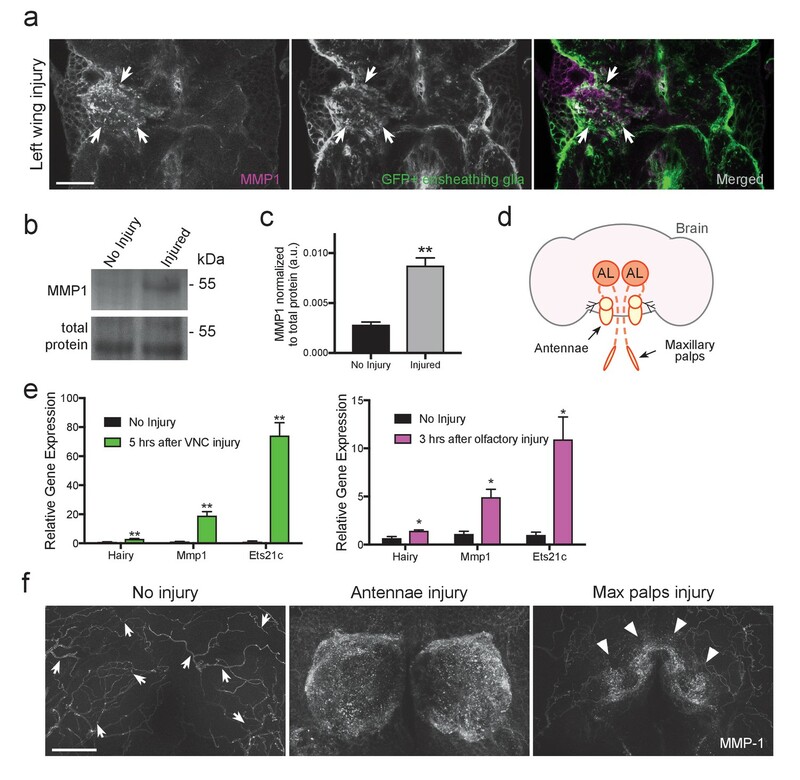 We have also previously shown that antennal nerve injury induces striking cytoskeletal remodeling, which requires activity of the protein phosphatase 4 (PP4) complex and likely also the Rho GTPase Rac1 in responding glia (Winfree et al., 2017). To determine how glial MMP-1 influences actin polymerization and cytoskeletal remodeling in response to axon injury, we stained control and glial MMP-1RNAi brains with phalloidin-TRITC, which selectively binds filamentous actin (Wulf et al., 1979). These flies also expressed UAS-mCD8::GFP under the control of TIFR-Gal4 to visualize ensheathing glial membranes. In control brains, we found that at both one and three days after antennal injury, increased phalloidin levels mirrored that of expanding glial membranes and MMP-1 expression after injury (Figure 10a,b). One day after antennal nerve axotomy, phalloidin staining was most robust at the periphery of the antennal lobes, while staining became more notable internally in the neuropil of the antennal lobe after three days (Figure 10a,b). Interestingly, ensheathing glial expression of MMP-1RNAi strongly attenuated the increase in phalloidin staining at both time points (Figure 10a–c). We propose that reduced phalloidin staining in MMP-1-depleted animals corresponds to attenuated cytoskeletal remodeling within ensheathing glia due to delayed glial infiltration of the antennal lobe neuropil, although we cannot rule out the possibility that secreted MMP-1 also non-autonomously influences actin remodeling in other AL cell types. Nonetheless, our collective results indicate that ensheathing glial generated MMP-1 is essential for proper dynamic glial responses to axotomy in the adult fly brain. Injury-induced ensheathing glial membrane expansion and actin dynamics are attenuated after antennal injury in MMP-1-depleted animals. (a) Representative single antennal lobe immunostainings of Phalloidin-TRITC (magenta) in control and MMP-1RNAi animals (uninjured flies and one or three days after antennal injury). Ensheathing glial membranes labeled with membrane tethered-GFP (green). Representative maximum intensity projections shown (5 μm). (b) Quantification of Phalloidin-TRITC expression one and three days after injury inside the antennal lobe and within the AL border in control and MMP-1RNAi flies. Antennal lobes quantified: Control: Day 1 N = 18; Day 3 N = 18. MMP-1RNAi: Day 1 N = 17; Day 3 N = 12. Mean ± SD plotted; ****p<0.0001; ns = not significant; unpaired t-test. (c) Quantification of total Phalloidin-TRITC within the antennal lobes shown in (a); antennal lobes quantified: Control: No Injury N = 22; Day 1 N = 16; Day 3 N = 18; MMP-1RNAi: No Injury N = 18; Day 1 N = 18; Day 3 N = 12. Mean ± SEM plotted; ns = not significant, ****p<0.0001; Two-way ANOVA with Sidak post hoc test. Scale bars = 30 μm. Genotypes: Figure 9a–c: Control: TIFR-Gal4/+. MMP-1 RNAi: TIFR-Gal4/UAS-MMP-1RNAi. Because glia must infiltrate the antennal neuropil to access injured axons and efficiently clear degenerating axonal material (Doherty et al., 2009; Logan and Freeman, 2007; MacDonald et al., 2006), we wondered if glial clearance of severed axons would be inhibited by loss of MMP-1. We performed glial specific knock down of MMP-1 in adult flies, using Gal80ts to temporally control activation of UAS-MMP-1RNAi. These flies also carried an OR85e-mCD8::GFP transgene, which labels a subset of maxillary olfactory receptor neurons (OR85e) with membrane-tethered GFP. We performed bilateral maxillary nerve axotomy and quantified GFP+ axonal debris 3 days after injury. Significantly more OR85e axonal material lingered in the brain of MMP-1RNAi flies 3 days after injury (arrowheads Figure 11a,b). We also confirmed that MMP-1 accumulation on severed nerves was significantly reduced in MMP-1-depleted animals (arrows Figure 11a,c). Finally, to complement our RNAi analysis, we used an independent method to inhibit MMP-1 activity. Tissue inhibitor of metalloproteinase (TIMP) acts as an endogenous inhibitor of MMP-1 by binding to the catalytic domain and inhibiting function (Brew and Nagase, 2010; Page-McCaw et al., 2003). We expressed UAS-TIMP in adult glial cells, quantified OR85e GFP+ axons 3 days after nerve injury, and importantly, found that TIMP overexpression also delayed clearance of degenerating axons 3 days after injury (Figure 11d,e). Collectively, our results suggest that Draper-dependent activation of MMP-1 is essential for ensheathing glia to invade neuropil regions and properly clear degenerating axonal debris after nerve injury. Adult specific inhibition of MMP-1 in glia leads to delayed clearance of adult degenerating axons. (a) GFP-labeled maxillary ORN axons. (green) before and three days after maxillary palp nerve axotomy in control animals and following adult specific glial knockdown of MMP-1. Arrowheads point to glomeruli quantified in (b). MMP-1 immunostainings in same brains (at lower magnification) shown in bottom panels (magenta). Arrows point to OR85e glomeruli regions quantified for MMP-1 fluorescence in (c). (b) Quantification of axon clearance three days after injury. Antennal lobes quantified: Control: N = 22. MMP-1RNAi: N = 30. Mean ±SEM plotted; ****p<0.0001; unpaired t test. (c). Quantification of MMP-1 fluorescence in (a). Antennal lobes quantified: Control. N = 27; MMP-1RNAi: N = 30. Mean ±SEM plotted; ****p<0.0001; unpaired t test. (d) GFP-labeled maxillary ORN axons before and three days after maxillary palp nerve axotomy in control animals and adult specific glial overexpression of TIMP. Arrowheads point to perdurance of axon debris in TIMP-expressing flies after axon injury. (e) Quantification of OR85e axon clearance three days after axotomy. Antennal lobes quantified: Control: N = 20; UAS-TIMP: N = 32. Mean ±. SEM plotted; *p<0.05; unpaired t test. Scale bars = 30 μm. Genotypes: Figure 10a: Control: w1118; OR85e-mCD8::GFP, tubulin-Gal80ts/+; repo-Gal4/+. MMP-1 RNAi: w1118; OR85e-mCD8::GFP, tubulin-Gal80ts/UAS-MMP-1RNAi; repo-Gal4/+. Figure 10d: Control: w1118; OR85e-mCD8::GFP, tubulin-Gal80ts/+; repo-Gal4/+. UAS-TIMP: w1118; OR85e-mCD8::GFP, tubulin-Gal80ts/+; repo-Gal4/UAS-TIMP. The fundamental components of innate glial immune responses to neurodegeneration are strikingly similar in flies and vertebrates. In mammals, acute insults such as spinal cord injury and stroke, activate numerous transcriptional cascades in reactive glia (Herrmann et al., 2008; Kim et al., 2002; Park et al., 2016; Pennypacker et al., 1994; Yu et al., 1995), but ascribing specific physiological roles to each member of the pathway is an ongoing and challenging endeavor. We have developed a novel in vivo injury model in the adult Drosophila VNC and defined a comprehensive dataset of conserved genes that are acutely up- and downregulated in response to nerve injury. This injury-responsive transcriptome now provides a foundation for translatable experiments in Drosophila that will rapidly advance our understanding of innate glial immunity mechanisms. Here, we provide the first in vivo transcriptome profiling analysis in a Drosophila nerve injury model. Our assay revealed cohorts of upregulated genes implicated in innate immunity in other phagocytic Drosophila cell types and in both professional and amateur vertebrate phagocytes, including members of the Toll-like signaling pathway, which validates the adult VNC injury assay as a reliable model to explore prospective cascades that govern innate glial responses. We should note that because our VNC harvests did not utilize a glial-specific isolation strategy, our dataset likely contains some transcripts upregulated in neurons projecting to peripheral injured structures. Notably, mammalian CNS motor neuron axons do not regenerate after mechanical or ischemic injury unless intrinsic proregenerative transcriptional programs are activated through neuron preconditioning (Neumann and Woolf, 1999; Neumann et al., 2002; Qiu et al., 2005). Similar axonal regeneration programs have been defined in Drosophila larval motoneurons, including retrograde pathways that require the highly conserved mediators dual leucine zipper kinase (DLK) and cAMP/PKA (Brace and DiAntonio, 2017; Hao et al., 2016; Xiong et al., 2010). 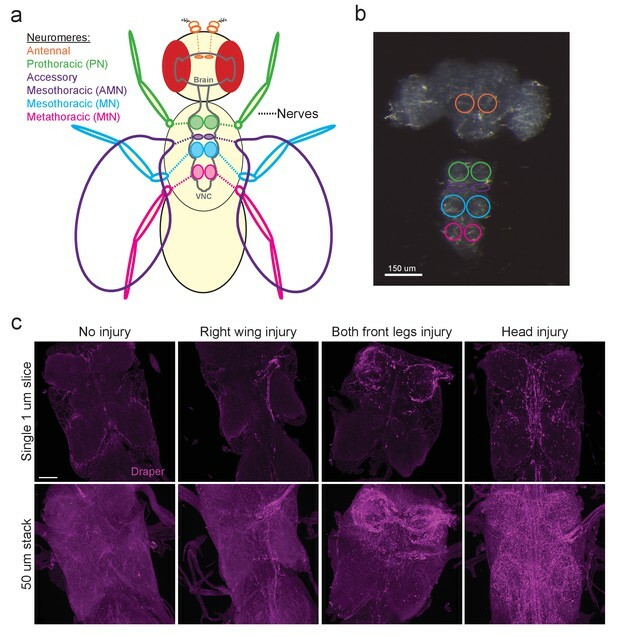 Robust axon regeneration models have not yet been fully developed in adult flies, although some groups have shown that adult Drosophila neurons do have some capacity, albeit limited, to regenerate after an injury event (Ayaz et al., 2008; Soares et al., 2014). It remains to be determined if the adult VNC injury model will reveal transcriptional changes in motor neurons (or other neuronal subtypes) that are components of a preconditioning program. Our screen revealed MMP-1 as a novel gene upregulated in ensheathing glia in the fly CNS in response to axon degeneration. In addition, we discovered that injury-induced expression of MMP-1 in glia requires the engulfment receptor Draper, as well as the transcription factors AP-1 and STAT92E. Our AP-1 and STAT92E loss of function results mirror findings in other organisms that report MMP genes are regulated by JNK signaling, AP-1 and/or STAT92E (Chakraborti et al., 2003; Korzus et al., 1997; Stevens and Page-McCaw, 2012), highlighting the AP-1/STAT92E/MMP-1 cascade as an evolutionarily conserved module of innate glial immunity. Previous work has demonstrated a requisite role for Draper during infiltration of Drosophila neuropil after olfactory nerve injury (MacDonald et al., 2006; Ziegenfuss et al., 2012), but the molecular mechanisms were unclear. Our work is now the first to couple Draper, which is classically considered an engulfment recognition receptor (Chung et al., 2015; Logan et al., 2012; Tasdemir-Yilmaz and Freeman, 2014; Zhou et al., 2001), to a transcriptional cascade that we propose actively promotes extracellular matrix remodeling and glial cell motility via MMP-1 induction. Indeed, MMPs can cleave extracellular matrix molecules to accommodate increased cell migration in a variety of organs and cell types, including metastatic cancer cells (Al-Alem and Curry, 2015; Deryugina and Quigley, 2015; Page-McCaw, 2008; Thakur and Bedogni, 2016). MMPs can also target specific ligands or receptors to reveal cryptic sites and modulate intercellular signaling (Bauvois, 2012; Chakraborti et al., 2003; Page-McCaw et al., 2007; Zhang et al., 2006). 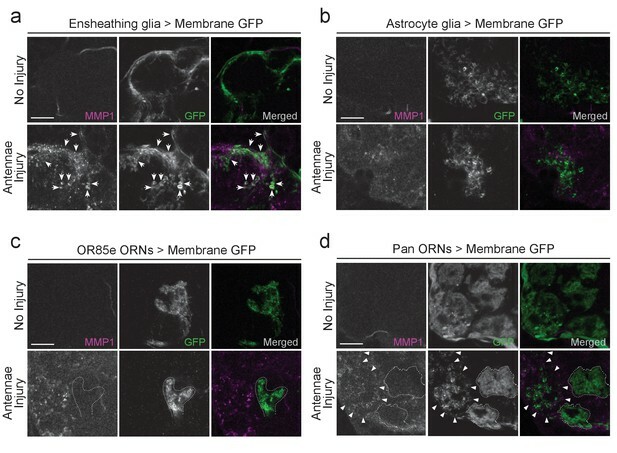 Here, we show that in response to adult antennal nerve axotomy, activation of the ensheathing glial receptor Draper is required for the production of the secreted protease MMP-1 in ensheathing glial cells within 24 hr. Our results also reveal that loss of MMP-1 inhibits dynamic membrane expansion of ensheathing glia and delays glial clearance of degenerating olfactory receptor neuron axons. We favor a model in which released MMP-1 remodels the extracellular matrix – and perhaps transmembrane molecules (e.g. adhesion factors) - to facilitate ensheathing glial infiltration into the inner regions of the antennal lobes that house a large number of degenerating axons. This model is supported by the fact that we observe increasing levels of MMP-1 in more central regions of the antennal lobes over time (three days post-injury, as compared to one day post-injury), a time that closely corresponds to ensheathing glia membrane extension and accumulation within the central antennal lobes. However, we can’t exclude the possibility that secreted MMP-1 also cleaves factors on degenerating axons to encourage fragmentation or perhaps even release peptide fragments that serve as secondary ligands to further stimulate responses from local ensheathing glia. MMPs do not appear to cleave target proteins at specific consensus sites. Therefore, identifying the likely abundant MMP targets in the CNS has been an ongoing challenge. One molecule cleaved by Drosophila MMP-1 during development is the transmembrane adhesion factor NinjurinA (NinjA). Most organs of the fly contain an intricate tracheal network that transports essential gases or fluids (Samakovlis et al., 1996), and MMP-1 cleavage of NinjA on the surface of tracheal cells is essential for proper branching and formation of a mature tracheal system (Zhang et al., 2006). Interestingly, Ninjurins are a conserved family of factors that were initially identified by screening for upregulated genes in a rodent nerve injury assay (Araki and Milbrandt, 1996). Several groups have since confirmed that one or more Ninjurins are upregulated in injury, stress, and inflammation models, although the specific function of Ninjurins is still unclear (Jennewein et al., 2015; Koike et al., 2008; Lee et al., 2016). 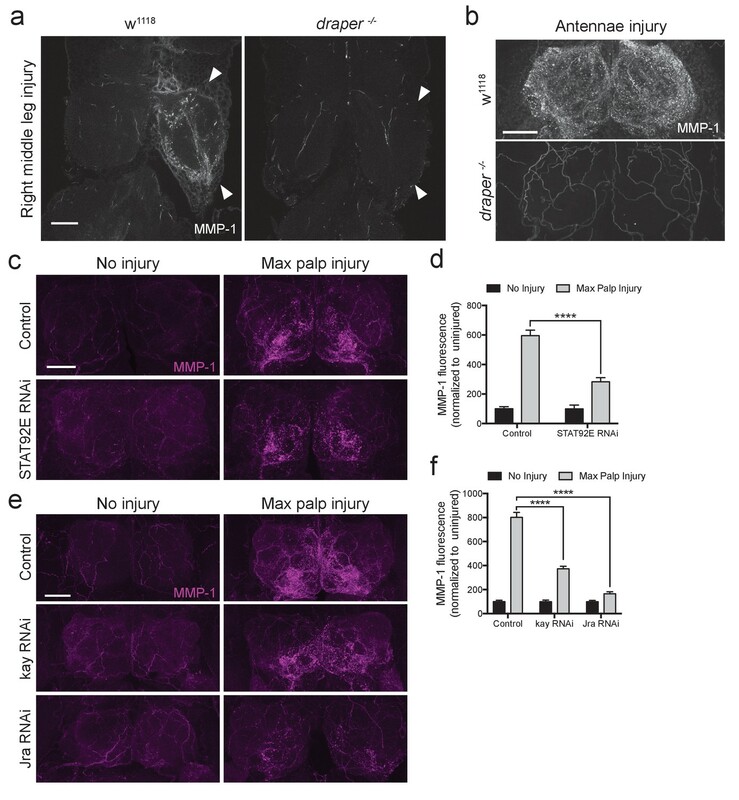 Intriguingly, NinjA was also upregulated in our VNC injury screen (Figure 4d and Figure 4—source data 2), and it will be interesting to explore a potential mechanistic connection between MMP-1 and NinjA in the context of glial recruitment to injury sites and phagocytic clearance of degenerating axonal debris. Finally, the mammalian genomes contain about two dozen MMP genes, and the encoded proteases fall into three different structural categories: secreted, GPI-anchored, and transmembrane-tethered (Chakraborti et al., 2003). The significance of spatially restricting select MMPs is still unclear. Drosophila MMP-1 is secreted, while MMP-2 is GPI-anchored (Page-McCaw, 2008), and it remains unclear whether MMP-2 also contributes to innate glial immunity in the adult fly brain. Nonetheless, the fly clearly offers a powerful model to explore important questions about target specificity and release mechanisms of MMP in reactive glia, as well as in other contexts (Depetris-Chauvin et al., 2014). In addition to influencing disease and cancer progression (Gialeli et al., 2011; Rosenberg, 2002) and injury responses (Candelario-Jalil et al., 2009), MMPs can also influence structural and functional synaptic remodeling in the healthy brain (Fujioka et al., 2012). For example, MMP-9 levels are significantly increased in the CA1 region of the hippocampus after induction of late-phase long-term potentiation (L-LTP) (Huntley, 2012). Pharmacological or genetic inhibition of MMP-9 blocks not only L-LTP, but also the spine enlargement that is typically associated with persistent LTP. Conversely, gain of function experiments have revealed that MMP-9 is sufficient to promote synaptic structural remodeling, likely through proteolytic cleavage of integrins and/or integrin ligands (Huntley, 2012). These recent findings introduce new concerns for how pathological release of MMPs might influence neural circuitry and function. High levels of MMP activity or expression could contribute to maladaptive wiring after acute injury and in disease states. Elucidating the upstream signaling pathways that modulate MMP expression, as well as defining the full array of MMP targets in the healthy and diseased brain, will be critical to parse out the protective versus potentially detrimental role of MMPs in the CNS. Given that the Draper receptor, STAT, AP-1, and MMP family of secreted proteases are all highly conserved, we anticipate that our work will provide new insight into how MEGF10 mechanistically contributes to glial engulfment of apoptotic neurons and synaptic/axonal clearance, as well as functional neuronal recovery, in mammals. Peripheral nerve injury was induced in adult Drosophila by removing legs, wings, and/or head with Vannas scissors (World Precision Instruments # 500260 G, RRID:SCR_008593) while flies were anesthetized with CO2. Legs were severed at the midpoint of the femur, and wings were severed at longitudinal vein 6. Injured flies were placed dorsal side down on 1% agarose pads in a covered petri dish. In experiments where the head was also removed, the head was removed prior to the legs and wings. We found it was critical to include a wet Kim wipe in the dish to prevent desiccation of the flies. Control flies were also placed in 1% agarose vials and both control and experimental (injured) animals were kept at room temperature for 5 hr. VNCs were dissected in Jan’s Saline (0.5 mM Ca2+) and immediately frozen on dry ice. Injured animals that did not move the remaining proximal portion of leg in response to gentle forcep manipulation were discarded. For immunohistochemical experiments where only single peripheral organs were removed, the flies were placed back onto food vials after injury. ORN axotomy was induced in adult Drosophila by surgical ablation of the third antennal segments or maxillary palp structures. Flies were maintained at 22–23°C. For adult specific knock down or over expression of genes, flies expressing a temperature sensitive version of Gal80 (tubulin-Gal80ts) were shifted to 30°C for one week to induce glial expression of each gene of interest and returned to 30°C after ablating maxillary palps until dissection. Control flies for these experiments were treated with the same temperature shift protocol. Adult Drosophila whole flies or heads were fixed (1xPBS, 0.1% Triton X-100, 4% PFA) at room temperature for 16 min. Samples were then washed 1 × 1 min and 2 × 5 min while rocking in PBSTx0.1 (1xPBS, 0.1% Triton X-100) at room temperature. Fixed samples were maintained on ice while VNCs or brains were dissected at room temperature in PBSTx0.1. Tissue was post fixed for 16 min, washed 2 × 2 min in PBSTx0.1, and incubated overnight with primary antibodies in PBSTx0.1. The next day, samples were washed 4 × 30 min with PBSTx0.1 and incubated with secondary antibodies (in PBSTx0.1) for 2 hr at room temperature. Samples were then washed 4 × 30 min with PBSTx0.1 and mounted on slides in VECTASHIELD mounting media (Vector Labs, RRID:AB_2336789). All samples were imaged on a Zeiss LSM 700 with a Zeiss 40 × 1.4 NA oil immersion plan-apochromatic lens. VNCs and brains within a single experiment (i.e. those being directly compared for quantification) were whole mounted under a single #1.5 cover glass in VECTASHIELD. All samples in a given experiment were imaged on the same day with the same confocal microscope settings. Volocity 3D Image Analysis Software (Perkin Elmer, RRID:SCR_002668) was used for fluorescence quantification and GraphPad Prism (RRID:SCR_002798) was used for statistical analysis. Quantification of OR85e GFP-labeled glomeruli was performed on 3D volumes segmented to GFP signal in Volocity. Total intensity measurements were calculated and background fluorescence was subtracted. To quantify MMP-1 levels in adult brains after maxillary palp injury, total intensity measurements were calculated in regions of interest made around the entire antennal lobe. Glial membrane expansion one day after antennal nerve axotomy was quantified by measuring the thickness of GFP+ ensheathing glial membranes at several locations around each antennal lobe on single confocal slices at a consistent anterior depth of 6 μm into the brain. Primary antibodies were used at the following dilutions: chicken anti-GFP (ThermoFisher, #A10262, RRID:AB_2534023) at 1:1000; mouse anti-Draper (Developmental Studies Hybridoma Bank, 8A1 RRID:AB_2618106 and 5D14 RRID:AB_2618105) at 1:400, guinea pig anti-Draper (gift from E. Kurant) at 1:10000, mouse anti-MMP-1 (Developmental Studies Hybridoma Bank, 14A3D2 RRID:AB_579782, 3A6B4 RRID:AB_579780, 3B8D12 RRID:AB_579781, 5H7B11 RRID:AB_579779) at 1:50 used at 1:1:1:1 ratio, Phalloidin-TRITC (Sigma, #P1951 RRID:AB_2315148) at 1:250. All secondary antibodies (Jackson Immunoresearch, 715-295-150 RRID:AB_2340831, 703-545-155 RRID:AB_2340375, and 706-605-148 RRID:AB_2340476) were used at a dilution of 1:400. VNCs were dissected in Schneider’s Drosophila Medium (ThermoFisher, #21720001) and homogenized in 3 μL 1x Loading Buffer per VNC. Protein lysate of 5–6 VNCs were loaded onto 4–20% Tris-Glycine gels (Lonza, #59517) and transferred to Immobilon-FL (Millipore, #IPFL00010). After transfer, total protein density per lane was measured using MemCode Reversible Protein Stain (ThermoFisher, #24585). Blots were probed with mouse anti-MMP-1 (1:100 at a 1:1:1:1 ratio) and incubated overnight at 4°C, washed several times with 1xPBS/0.01% Tween 20, and probed with appropriate fluorophore-conjugated antibodies secondary antibody at 1:2000 (Jackson Immunoresearch, #715-625-150 RRID:AB_2340868) for 2 hr at room temperature. Additional washes were performed with 1xPBS/0.01% Tween 20 and a final wash in 1xPBS. Total protein stain blots were imaged on G:BOX F3 Imaging System and analyzed with ImageJ (RRID:SCR_003070); fluorescent blots were imaged on Li-cor Odyssey CLx (RRID:SCR_014579) quantitative western blot imaging system and data was quantified using LiCor Image Studio software (RRID:SCR_014211). Images in Figure 5 has been cropped for presentation. Full size image is presented in Figure 5—figure supplement 1. For each biological replicate, 60–80 w1118 flies (3–5 days old) with equal numbers of males and females were injured, and 50 VNCs were used per biological replicate for RNA extraction. For injured samples, all six legs, both wings, and the head were severed with Vannas scissors while flies were anesthetized with CO2 as described above. Frozen tissue was crushed in 500 ul of Trizol with glass beads and a pestle and then stored at −80°C until all samples were ready for RNA extraction. A total of 5 biological replicates were collected for each condition (injured and uninjured). RNA extraction was performed by first spinning crushed material at 11,000xg for 10 min at 4°C to pellet cuticle and lipids. Trizol supernatant was transferred to fresh tube, 1/5 vol of chloroform was added to each sample and mixed in a 5’ Prime- Heavy Phase Lock Gel, and samples were then centrifuged (12,000xg for 15 min). The aqueous phase was removed and RNA was isolated on RNA Clean and Concentrator−5 columns (Zymo Reserach #R1016). DNAse digestion using Ambion DNA-free kit (ThermoFisher #AM1906) was performed and RNA was quantified using the Qubit fluorometer. Total RNA samples were sent to the Massively Parallel Sequencing Shared Resource (MPSSR) at Oregon Health and Science University (OHSU) for library preparation. Briefly, total RNA concentration and sample integrity was assessed using an Agilent RNA 6000 Pico chip on an Agilent Technologies 2100 Bioanalyzer instrument (Figure 4—source data 1). Following quantification and quality control, 325 ng of total RNA was subjected to ribosomal RNA reduction via Epicenter’s Ribo-Zero Gold kit (Human/Mouse/Rat). The output was then used with Illumina’s TruSeq RNA Sample Preparation Kit v2, beginning at the RNA fragmentation step. Poly(A) selection was not performed due to limited starting material. Barcode indexing adapters were ligated and all 10 samples (5 control and five injured) were sequenced (100 bp single end reads) on a single flow cell lane on the Illumina HiSeq 2500 Seqeuncer. Across samples, an average of 85.2% of the fragments mapped to the Drosophila genome; 41.2% of these mapped to exons and 9% to introns (Figure 4—source data 1). Notably, 22% of reads corresponded to ribosomal RNA (rRNA) and small nuclear RNA (snRNA). Enhanced ribosomal RNA mapping and reduced exon mapping may have been influenced by the fact that our ribosomal RNA depletion kit was not specific to Drosophila. RNA-seq alignment was performed with PerkinElmer GeneSifter Analysis Edition (GSAE) software. Briefly, HiSeq 2500 reads were uploaded to Geospiza’s server for alignment to the Drosophila melanogaster genome (Release 5.57) via the Burrow-Wheeler Alignment tool .Li and Durbin, 2009 Raw read counts were transformed to transcripts per kilobase million (TPM) (Wagner et al., 2012) (Figure 4—source data 2) via first dividing by the length of the longest annotated transcript for a given gene and then dividing by the number of mapped reads for that particular biological replicate, thereby normalizing for differences in transcript length and read depth. Before statistical analysis, the gene list was filtered to ensure at least one group (injured or unInjured) had an average TPM value >2. This cutoff has been reported to robustly identify actively transcribed genes (Wagner et al., 2013). This produced a list of 9364 expressed genes that were analyzed for differential expression via the Shiny Transcriptome Analysis Resource Tool (START) application (Nelson et al., 2017). Briefly, START performs trimmed mean of M values (TMM) normalization (Robinson and Oshlack, 2010), then transforms with mean-variance modelling at the observational level (voom) (Law et al., 2014) and then tests for group effects via a linear regression model. Lastly, false discovery rate is corrected via the Benjamini-Hochberg procedure (Benjamin and Hochberg, 1995). In our studies, we utilized a conservative adjusted p-value of <0.01 for considering differential gene expression as significant. Genes that were significantly changed in the injured condition were converted to their closest orthologs in various model organisms using DIOPT (DRSC Integrative Ortholog Prediction Tool) (Hu et al., 2011) (Table 1—source data 1). Finally, Annokey (Park et al., 2014) analysis was performed on upregulated genes to identify factors previously implicated in cell movement, migration, and invasion (Table 1a, b and Table 1—Source code 1–3). Total RNA was extracted and quantified as described for the RNA-seq screen. For cDNA synthesis, 60 ng of DNAse-treated total RNA was reverse transcribed using qScript cDNA SuperMix (Quantabio # 95048–100). The resulting cDNA was diluted 1:5 and 5 ul was used for a single RT-PCR reaction. All real time assays were performed using TaqMan gene expression assays (ThermoFisher) and PerfeCTa FastMix II Rox (Quantabio, #95119–250) on a StepOne Real-Time PCR system (ThermoFisher). Ribosomal Protein L28 (Rpl28), TaqMan assay Dm01804541_g1 was used as a control housekeeping gene. Raw Ct values of Rpl28 were unchanged between the uninjured (28.31, SEM. 3037, n = 3) and 5 hr post injury (28.34, SEM. 2030, n = 3) samples. Our RNA-seq results confirmed that Rpl28 is an appropriate housekeeping gene (Digital gene expression levels of Rpl28 (n = 5): No Injury – 77.5 ± 3.14 TPM and Injured – 75.5 TPM ±3.93 TPM. Additional TaqMan gene expression assays were utilized: Ets21c-Dm01814139_m1; PGRP-SA-Dm01837990_g1; MMP-1-Dm01820359_m1; Relish-Dm02134843_g1; Ninjurin A-Dm01798347_g1; Hairy- Dm01822363_m1; Rac2-Dm01840631_s1; Cactus-Dm01807760_m1; Notch-Dm01841974_g1; CG6277 – Dm02369365_s1. For all experiments, flies were between 3–10 days old. The following Drosophila genetic insertions were used: OR85e-mCD8::GFP/CyO (gift from B. Dickson), UAS-mCD8::GFP (Bloomington 5137, RRID:BDSC_5137), UAS-mCD8::GFP (Bloomington 5130, RRID:BDSC_5130), Repo-Gal4 (MacDonald et al., 2006), tubulin-Gal80ts (Bloomington 7108, RRID:BDSC_7108), 10XSTAT92E-dGFP (Bach et al., 2007), TRE-GFP (Chatterjee and Bohmann, 2012), Gr22c-Gal4 (Bloomington 57605, RRID:BDSC_57605), TIFR-Gal4 (Yao et al., 2007), alrm-Gal4 (Doherty et al., 2009), Dee7-Gal4 (Doherty et al., 2014), DraperΔ5rec9 (MacDonald et al., 2006), UAS-MMP-1RNAi (Uhlirova and Bohmann, 2006), UAS-MMP2RNAi (Chatterjee and Bohmann, 2012), UAS-TIMP (Bloomington 58708, RRID:BDSC_58708), w1118 (Bloomington 5905, RRID:BDSC_5905), UAS-DraperRNAi (MacDonald et al., 2006), MMP-1-LacZ (Chatterjee and Bohmann, 2012), UAS-STAT92ERNAi (Vienna Drosophila Resource Center 43866), UAS-kayakRNAi (Bloomington 31391, RRID:BDSC_31391), UAS-JraRNAi (Bloomington 3159, RRID:BDSC_3159), orco-Gal4 (Larsson et al., 2004) (Bloomington 23292, RRID:BDSC_23292). Biochimica Et Biophysica Acta (BBA) - Reviews on Cancer 1825:29–36. Biochimica Et Biophysica Acta (BBA) - Molecular Cell Research 1803:55–71. The Journal of Pathology 237:273–281. Molecular and Cellular Biochemistry 253:269–285. Cold Spring Harbor Perspectives in Biology 7:a020370–26. The Journal of Comparative Neurology 520:2067–2085. American Journal of Respiratory Cell and Molecular Biology 53:656–663. Journal of Biological Chemistry 277:40594–40601. The Journal of Dermatology 35:6-17. Journal of Biological Chemistry 272:1188–1196. Cell Death and Differentiation 20:1140–1148. Journal of Biological Chemistry 274:21491–21494. Nature Reviews Molecular Cell Biology 8:221–233. Seminars in Cell & Developmental Biology 19:14–23. Source Code for Biology and Medicine 9:15–19. Molecular Biology of the Cell 23:1068–1079. Bioorganic & Medicinal Chemistry 15:2223–2268. Cell Death and Disease 8:e2623. Progress in brain research 105:245–253. Thank you for submitting your article "A novel Drosophila injury model reveals severed axons are cleared through a Draper/MMP-1 signaling cascade" for consideration by eLife. Your article has been favorably evaluated by Eve Marder (Senior Editor) and three reviewers, one of whom is a member of our Board of Reviewing Editors. The following individual involved in review of your submission has agreed to reveal his identity: Oren Schuldiner (Reviewer #2). In this paper, Purice et al. examine the molecular mechanisms underlying glial clearance of neuronal debris following neuronal injury. The authors show that a transcriptional program mediated by the cell surface receptor Draper and its downstream target, a STAT protein, occurs following a number of neuronal injury paradigms. They use the prevalence of the response to characterize gene expression changes in nerve cords where most neurons are undergoing degeneration, and identify targets. Analysis reveals that one gene, encoding a matrix metalloprotease MMP-1, is upregulated and secreted by glia. 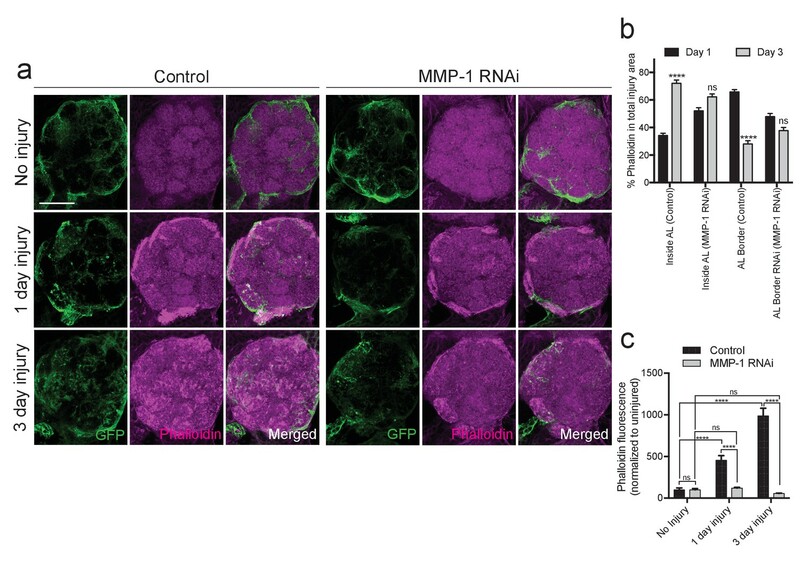 MMP-1 is required for morphological changes in glia, and for efficient engulfment of neuronal debris, and represents the first known functional target of the Draper injury signaling pathway. How glia react to neuron injury is an important and active field of research as it lies at the heart of development, plasticity, and disease of the nervous system. The work in this paper takes an important step forward in identifying a strategy to explore underlying molecular mechanisms, and in identifying a specific molecular effector. The paper is very clearly written, the experiments appear well controlled, and overall the conclusions justified. However, several points and concerns should be addressed as summarized below. 1) The data demonstrate that ensheathing glial MMP1 is required for the clearance of severed axons as well as glial membrane expansion in response to nerve injury. 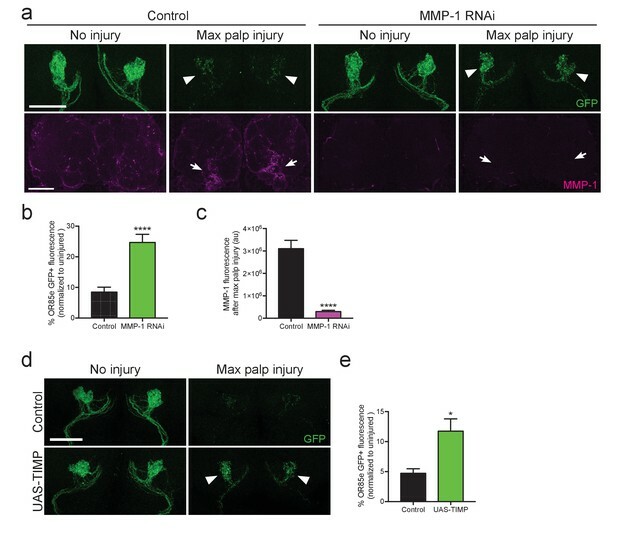 While the data show that it is ensheathing glial MMP that has a regulatory role in the injury response, it appears that by 3 days post injury, MMP1 is not localized to ensheathing glia (Figure 8). It is a bit unclear how the authors are envisioning how MMP1 is acting to regulate membrane expansion. Is the idea that MMP1 is secreted by ensheathing glia and that by 3 days post injury, ensheathing glial MMP1 is binding to/acting on a different cell type? The data seem to suggest that this could be a very likely possibility. To explore this further, the authors should provide some high magnification images at 3 days post injury of MMP1 stains with counter stains for other tissue types like astrocytes, neuronal debris, and healthy neurons. 2) The analysis of glial subtypes is a bit simplistic and could be clarified. Please include a magnified image of the anti-Drpr and CD8 driven by the TIFR and Alrm-Gal4s to provide more convincing evidence that indeed Draper is expressed in ensheathing glia. To strengthen the claim that these cells are ensheathing and not astrocytes, then cell specific RNAi followed by draper staining is needed. Otherwise this should be toned down in the text. 3) Figure 10 is important. However, the statements in the paper claim to have identified a Stat/Drpr/MMP1 cascade – for this, I think it is important to at least try to rescue the draper-/- phenotype with overexpression of MMP1 by ensheathing glia. 4) A more rigorous analysis of the RNASeq data is needed as well as more details and clarity on methods and decision on cutoffs and better presentation of data is needed. While no additional experiments are necessary, this is important as the RNASeq data are a key part of the paper and would significantly improve the logic of the connection between the two parts of the study. *Specific comments and suggestions from one reviewer are included below. Please include the raw data and explain what is a read and other necessary details of method and analyses. For example: how many genes were considered as "expressed" and how was this determined (is one read sufficient? Ten reads?). How were these reads normalized? At low expression levels the noise is very high – therefore, have the authors performed any thresholding to decide which expression data are reliable enough to actually compare – resulting in the total number of genes actually compared (one way to figure out a reasonable threshold would be to scatter plot – on log axes – two repeats and see from what expression levels they actually look similar); all these analyses should result in one big xls file that is well annotated and can be easily read – together, this would be the "data" which would be used for the comparisons. Comparison of the expression before and after injury: why was 1.2 fold chosen? this seems a bit low and p-values seem small, raising the possibility that the flow of the analysis needs to be reevaluated. All this results in a volcano plot in which the data is spread out and it is thus unclear how many genes are "grey" – thus not statistically changing their expression? This is also evident in Figure 4—source data 5 – all the genes that are expressed in the data set are unregulated. Seems unlikely that there are no genes that are present but not up or down regulated. The Y-axis for the volcano plot needs to be corrected to -log10 (p-value). The KEGG/GO analysis is not informative at all – what do we learn from this? Table 1 – the Annokey algorithm is not very informative (and therefore not very heavily used.) I understand that the authors want to find a meaningful way to transition from the RNAseq data to MMP1. ; however, this transition could be improved. One suggestion is to focus on one group of genes (which should obviously include MMP1, #13 in the entire list) and then check a few candidates and finally focus on MMP1. Thank you for resubmitting your work entitled "A novel Drosophila injury model reveals severed axons are cleared through a Draper/MMP-1 signaling cascade" for further consideration at eLife. Your revised article has been favorably evaluated by Eve Marder (Senior Editor), a Reviewing Editor, and one reviewer. The manuscript has been improved but there is one remaining issue that needs to be addressed before acceptance that relates to the analyses of the RNAseq data as outlined below. We suggest considering using a more conventional 2-fold change cut off for the analyses. However if a 1.2 fold change cut off is used, please provide ample explanation and justification as suggested by reviewer #2 below. Given the heterogeneity of the system, it is possible that key genes involved in glial response to injury may only be modestly upregulated in this transcriptional screen, but still be biologically relevant, as pointed out in your response to reviewer comment 2. 1) If the authors feel very strong about the 1.2 FC then they should explain their rationale within the text. I discourage the authors for going here – as one key reason for the low FC of some genes is the heterogeneity of the sample, in which some people might say – so why didn't they sort the glial cells to get a "tighter" expression pattern. 2) Use a 2FC – in reality, almost all of the genes that the authors want to highlight, like those in Figure 4C ARE induced by a factor of more than two – with the exception of Dor and Ced-6. I think it's a reasonable price to pay. You get a much tighter list of about 350 DE genes. MMP is also unregulated by MORE than 2FC. So I really don't see a good reason why not to opt for this solution. 3) A compromise might be the following: Do most of the analysis as suggested in #2 but then explain that many more potentially DE genes might exhibit a less than 2FC because the tissue is heterogeneous and for that reason, the authors are also providing another list of DE genes with a FC of 1.5 or 1.2 or whatever. 1) The data demonstrate that ensheathing glial MMP1 is required for the clearance of severed axons as well as glial membrane expansion in response to nerve injury. While the data show that it is ensheathing glial MMP that has a regulatory role in the injury response, it appears that by 3 days post injury, MMP1 is not localized to ensheathing glia (Figure 8). The reviewer is correct. We do see robust overlap between ensheathing glia (e.g. ensheathing glial driven GFP) and MMP1 at the periphery of the antennal lobes (where the glial cell bodies reside) in the first ~24 hours after antennal nerve injury. This MMP1 immunofluorescence appears to “shift” over days and by 3 days post-axotomy, more MMP1 is detected in interior regions of the antennal lobes. We propose that at day 1, much of the MMP1 signal at the periphery is MMP1 peptide that is being actively translated, transported, and recently released from the glial cells. Over the course of several days, we propose that this secreted factor (MMP1) becomes more apparent in interior regions of the lobes as it precedes thin extending glial membranes in the core region of the lobes. We attempted to demonstrate this shift by comparing MMP1 levels at the border of the antennal lobes (“AL Border”) and in the interior of the antennal lobes (“Inside AL”) (see Figure 9A, B). We acknowledge, however, that this concept could be described in greater depth in the body of the manuscript and have now modified the Results and Discussion to further clarify our observations in this set of experiments and how they are coupled to potential models. We should also note that following glial expression of MMP1RNAi, we observe no MMP1 in the antennal lobes 3 days after axotomy (Figure 9—figure supplement 1), which argues against possibility that local antennal lobe neurons (second order projections neurons, interneurons, etc.) are producing MMP1 and serving as the source of MMP1 in the interior regions of the antennal lobes. It is a bit unclear how the authors are envisioning how MMP1 is acting to regulate membrane expansion. Is the idea that MMP1 is secreted by ensheathing glia and that by 3 days post injury, ensheathing glial MMP1 is binding to/acting on a different cell type? The data seem to suggest that this could be a very likely possibility. To explore this further, the authors should provide some high magnification images at 3 days post injury of MMP1 stains with counter stains for other tissue types like astrocytes, neuronal debris, and healthy neurons. Yes, our favored model is that secreted MMP1 is targeting a key extracellular matrix molecule (or set of molecules) to accommodate additional glial membrane extension into the inner regions of the antennal lobes and more easily access degenerating axons. We cannot exclude the possibility that MMP is instead (or in addition) cleaving factors on the damaged axons to 1) enhance the physical degeneration of the injured nerves or 2) cleave axonal molecules to release additional injury signals that feedback to responding glia. These are all very interesting questions that we hope to investigate in the coming years. We have expanded the manuscript to further describe these models. We thank the reviewer for the above suggestion. We used various genetic drivers to express membrane-tethered GFP in 1) ensheathing glia, 2) astrocytes, 3) uninjured OR85e maxillary palp axons, or 4) all olfactory receptor neurons. In a new figure (Figure 6), we now show high magnification images of antennal lobe regions showing MMP-1 staining and each GFP-labeled subtype three days after axotomy (and uninjured controls). Briefly, we detect MMP-1 signal overlap with ensheathing glial membranes and actively degenerating axons, but not with astrocytes or intact subsets of olfactory receptor neuron projections – even those that are immediately adjacent to degenerating axons. Please see new version of Figure 6 and corresponding text for further details. We should note that this light microscopy analysis does not provide adequate resolution to definitively state if a small area of MMP1-positive fluorescence is directly associating with the ensheathing glial membrane, axon, or synaptic region. Future efforts that identify and characterize the specific MMP1 cleavage target(s), and where they reside, in this context will give us greater insight into how MMP1 is transported and functioning in the 3D space of the antennal lobe after nerve injury. As suggested, we have now provided high magnification images of Draper immunostaining and GFP-labeled membranes (ensheathing and astrocytes) in the injured VNC (new version Figure 2B, D). In addition, we replicated this VNC injury assay (wing injury) in flies expressing DraperRNAi in either ensheathing glia (TIFR-Gal4) or astrocytes (alrm-Gal4) and assessed anti-Draper and GFP signals. Briefly, expression of DraperRNAi in ensheathing glia resulted in almost a complete loss of Draper signal and no notable changes in glial membranes after wing injury. Knockdown of DraperRNAi in astrocytes did not appear to alter Draper upregulation after wing injury. (Please see new Figure 2C, E and the body of the text for more detail.) These results strongly suggest that ensheathing are responding to peripheral nerve injury, as in the adult olfactory system. Although we cannot rule out an as-yet-unknown response from astrocytes (for which we do not currently possess a readout), we feel our collective results validate a focused analysis on ensheathing glia, with regard to Draper/MMP1 activation and ensheathing glial migration and phagocytosis following nerve injury. We have attempted to perform MMP1 rescue experiments using two different strategies. Unfortunately, both approaches have been unsuccessful, and it’s currently impossible for us to provide any conclusive results. First, we tried to co-express UAS-DraperRNAi and UAS-MMP-1 under the control of the glial drivers repo-Gal4 or TIFR-Gal4. These flies also carried the tubulin-Gal80ts transgene so that we could temporally control Gal4 activity and express DraperRNAi and MMP-1 in adult glial cells. Although these experimental flies successfully eclosed as adults, they died with ~24 hours after shifting the temperature of the flies to “turn on” Gal4. This lethality appears to be due to the overexpression of MMP-1 since 1) DraperRNAi can be expressed successfully in glia for weeks in adult animals and 2) control cohorts flies overexpressing glial MMP-1 (lacking the UAS-DraperRNAi transgene) died within a similar timeframe. Unfortunately, a < 24-hour temperature shift in these experimental flies is insufficient to knockdown Draper levels in glia. Next, we attempted to generate new transgenic strains that would ultimately allow us to produce the following set of experimental flies: OR85e-mCD8::GFP,tubulin-Gal80ts/UAS-MMP1; TIFR-Gal4, DraperD5rec9/ DraperD5rec9. These flies would allow us to force expression of MMP-1 in adult ensheathing glia in draper null mutant flies and assess clearance of severed olfactory neuron axons. Unfortunately, these experimental flies failed to eclose as adults. It is most likely that this lethality is due to genetic background incompatibility, as opposed to MMP-1 expression. Although we could attempt this rescue experiment with a fresh approach (new genetic strains, etc. ), it would take a substantial amount of time. In addition, we propose that a conclusive result, positive or negative, would not alter our Draper/STAT/MMP1 model. Rescuing axon clearance in draper mutant flies with forced MMP-1 expression would indeed support our findings. We argue, however, that a failure to rescue would not be sufficient to exclude this model. There may be numerous transcriptional targets downstream of Draper that are essential to orchestrate a proper glial immune response. Forced expression of MMP-1 alone may simply not be sufficient to override the loss of the Draper and other downstream factors that are reliant on Draper activation. We thank the reviewer for providing thorough and thoughtful feedback regarding the presentation of our RNAseq results. We have done a substantial re-work of the data and agree that this provides additional key information regarding the analysis and more coherent presentation of our findings. 1) We have now provided data sets with the raw reads and read counts. Specifically, we have supplied an excel file with the raw read counts for all genes from both conditions (uninjured and injured) and all biological replicates. This information can be found in Figure 4—source data 2 and included in our uploaded data to the Gene Expression Omnibus (GEO). The GEO data also includes FASTQ files that contain the raw read sequences. We have provided a private GEO link that the reviewers can use to access this data (https://www.ncbi.nlm.nih.gov/geo/query/acc.cgi?token=oxaraumktfwhlyv&acc=GSE92759). After clicking the above link, enter “GSE92759” into the “GEO accession” box and click the “GO” tab. 2) In order to classify any given gene as “expressed,” we took the following approach: First, to normalize for differences in transcript length and read depth, raw read counts were converted to Transcripts Per Kilobase Million (TPM) (Wagner et al., 2012) by first dividing the raw read counts by the length of the longest annotated transcript for a given gene and then dividing by the number of mapped reads for a given biological replicate (these results are shown in Figure 4—source data 2). Second, the gene list was filtered to ensure at least one group (Injured or Uninjured) had an average TPM value >2, an appropriate, previously reported cutoff for identifying actively transcribed genes (Wagner et al., 2013). Based on this filtering, 9,364 out of 14,253 genes were deemed “expressed” in our dataset. Notably, we queried the FlyBase RNAseq expression database (http://flybase.org/static_pages/rna-seq/rna-seq_profile_search.html) using a expression threshold level of 1 RPKM (reads per kilobase million), and found that 9,363 and 9,219 genes are expressed in the L3 larval CNS and adult head, respectively, which provides confidence that our calculation of 9,364 expressed genes in the adult ventral nerve cord is a valid value. 3) While exploring the p-values associated with our differential gene expression analysis (addressed below in reviewer comment #2), we opted to use an alternative program, Shiny Transcriptome Analysis Resource Tool (START), to assess differential expression in our uninjured versus injured VNC samples (Nelson et al., 2016). Ultimately, the START analysis identified 348 fewer genes that were significantly changed (as compared to our previous EdgeR analysis). Thus, we have decided to report the more conservative START results in our revised manuscript, however this does not alter any of the key conclusions in the manuscript. In addition to using this new analysis method, we have more clearly explained how the data were analyzed in the Results and Materials and methods sections. We have also added a number of quality control analyses including a PCA analysis, sample distance heatmaps, and a correlation analysis (included in Figure 4 and Figure 4—source data 2), which more clearly presents the quality of our dataset. Comparison of the expression before and after injury: why was 1.2 fold chosen? this seems a bit low and p-values seem small, raising the possibility that the flow of the analysis needs to be reevaluated. All this results in a volcano plot in which the data is spread out and it is thus unclear how many genes are "grey" – thus not statistically changing their expression? 1) Our re-analysis of the data has resulted in a new volcano plot (Figure 4B), which addresses the valid concerns raised by the reviewer regarding visibility of the data points and plotting scale. Even with our new analysis (START) and cutoffs for significance, we still detect 169 genes that are significantly changed (green dots in Figure 4B: – adj. p-value <.03) but fall below our threshold of 1.2-fold change (log2FC=.263), suggesting that our cutoff of 1.2-fold may be on the conservative side. 2) Published research has identified numerous Drosophila genes known to be functionally involved in glial responses to axon injury (Figure 4—source data 4, previously Source Data 5). Our RNAseq analysis revealed that two of these genes were significantly up-regulated in the 1.2-fold range (Stat92e, 1.204-fold; Akt1, 1.253-fold). Moreover, 4 additional genes shown to be essential for proper glial responses to axon injury (InR, Pi3K92E, dos, and ced-6) were upregulated in the range of 1.3 to 1.7-fold. Even the critical glial immune response gene draper, which we know is at least 5-fold upregulated in the ventral nerve cord based on Q-PCR experiments, was only detected as upregulated 2.1-fold in the RNA-seq dataset. Together, these observations suggest that critical genes may only be modestly upregulated in our transcriptional screen. 3) Finally, instead of using an adjusted p-value of 0.05, we have conservatively set the adjusted p-value (Benjamini Hochberg) cutoff to <0.03 to increase our confidence in designating a gene as differentially expressed, despite a smaller fold change in expression. Regarding our initial p-values reported by the EdgeR analysis and adjusted with Benjamini-Hochberg, we did find that re-analysis with the START program resulted in higher p-values, although the calculated fold change for any given gene are very similar with both pipelines. Overall, despite the shift in p-values, no key results within the manuscript were altered. For example, in comparing our revised Figure 4—source data 4 with the previous version (named Source Data 5 in original submission), the same genes are deemed significantly differentially expressed via both pipelines. The only exception is ced-6, which was accidentally omitted from the original Source Data 5 table in our original submission. This is also evident in Figure 4—source data 5 – all the genes that are expressed in the data set are unregulated. Seems unlikely that there are no genes that are present but not up or down regulated. We apologize for the confusion prompted by poor labeling in this data file. Now renamed Figure 4—source data 4 in the resubmission, our column label suggested that a subset of genes were not expressed, when our intention was to indicate that they were not differentially expressed in injured VNC samples. This file has now been modified and more clearly labeled. The Y-axis for the volcano plot needs to be corrected to -log10 (p-value). This label has been changed. The KEGG/GO analysis is not informative at all – what do we learn from this? In order to conceptually streamline the presentation of the RNA-seq data, we have removed the KEGG/GO analysis. Indeed, a common challenge with large-scale screens is deciding how to strategically hone in on one factor, or a small set of specific factors, for follow-up in vivo analysis. Some choose to “focus on one group of genes” by choosing, for example, the top 10 most robustly upregulated genes; others may choose to focus on specific signaling pathway of choice. We opted to use Annokey so that we targeted a specific biological process (cell migration/invasion) that was informed by prior biological knowledge and published literature, but not biased by fold-upregulation in our screen, particularly since critical glial factors (e.g. draper) were not robustly upregulated in the RNA-seq dataset. In addition to Mmp-1, we are exploring several additional genes upregulated in our RNA-seq screen and investigating their role during axon degeneration and glial immunity in adult flies, but these preliminary results will form the basis for future manuscripts. We have modified the text in the Results section (which includes Annokey description) in hopes of making the transition from our screen description to our analysis of Mmp-1 in glial responses to nerve injury smoother. underrepresented (with regard to their fold induction). The fact that our initial positive control (Draper), which is a well-described innate immunity gene, was differentially expressed in our RNAseq screen by 2.09-fold supports this notion. Although we have excluded the 1.2-2.0 FC cohort of genes from the primary analysis, we favor providing this list of genes in an accessible manner to readers who may be interested in exploring their putative role in glial immunity in other systems/contexts. We would like to thank Dirk Bohmann, Marc Freeman, Bloomington Drosophila Stock Center at Indiana University, the Vienna Drosophila Resource Center, and the Developmental Studies Hybridoma Bank at the University of Iowa for flies and antibodies. © 2017, Purice et al.